My buddy Steve Lynch has popped up on my blog a few times. I met him originally through the Phoenix Automotive Press Association (PAPA) and he’s a published author many times over. 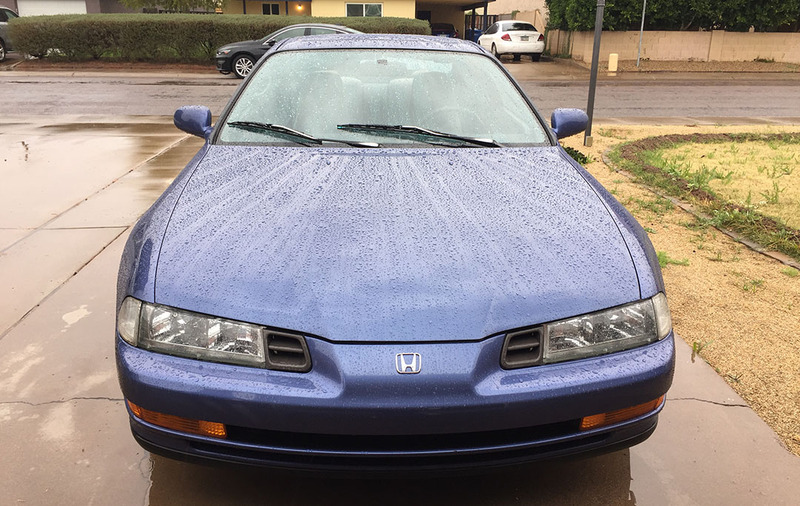 Over the years, Steve and I have gotten together for car talk and a couple of drives, including our feature on The Truth About Cars with “orphaned Hondas.” Steve was delighted to share with me the story of his latest automotive acquisition: a very well-kept, original 1992 Honda Prelude Si. 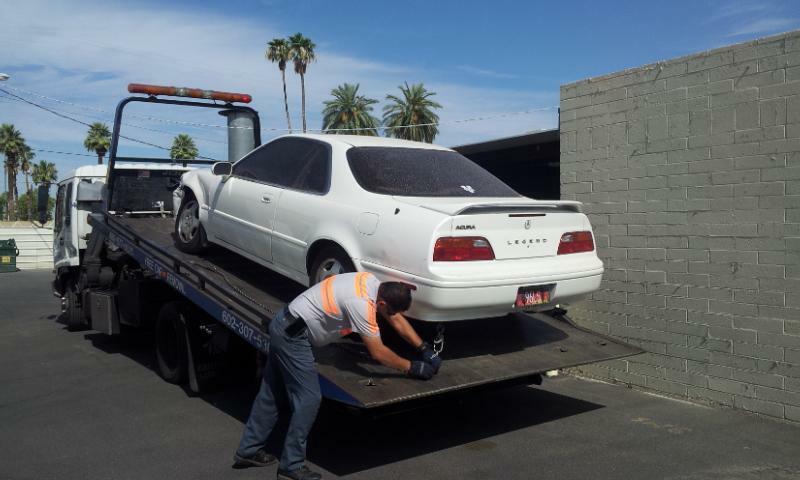 To Steve, this Prelude is more than just A-to-B transportation. It represents a life-sized souvenir from the days when he worked for Honda at its main office in Torrance, California. And to him and many others, it represents an icon of an era 25 years ago when cars were simple, fun to drive, and a little more interesting than the sea of cookie-cutter midsized sedans out on the roadways today. 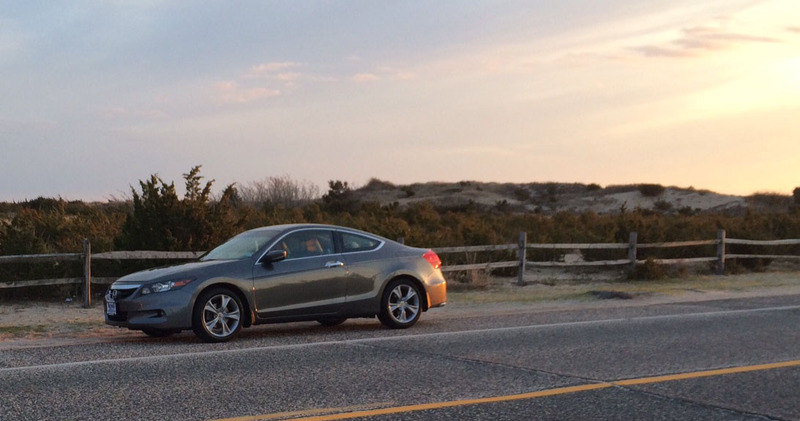 Any great car purchase story begins with a long-awaited “first drive” home. 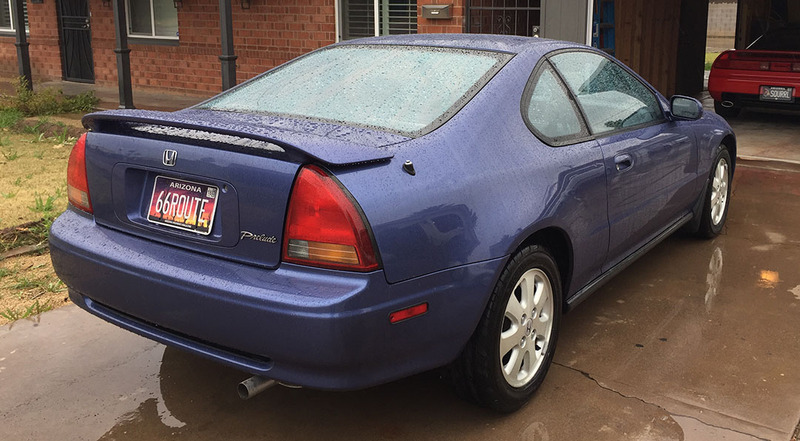 It just so happened that Steve’s first drive in his new Prelude was over 2,000 miles in distance since he’d flown to Florida to pick it up. Along the return trip, he turned over 100,000 miles on the Prelude’s odometer and visited some interesting roadside destinations like the “Florabama” beach bar, located at the Florida-Alabama state line. I only wish I’d been able to tag along to enjoy the miles and the scenery! 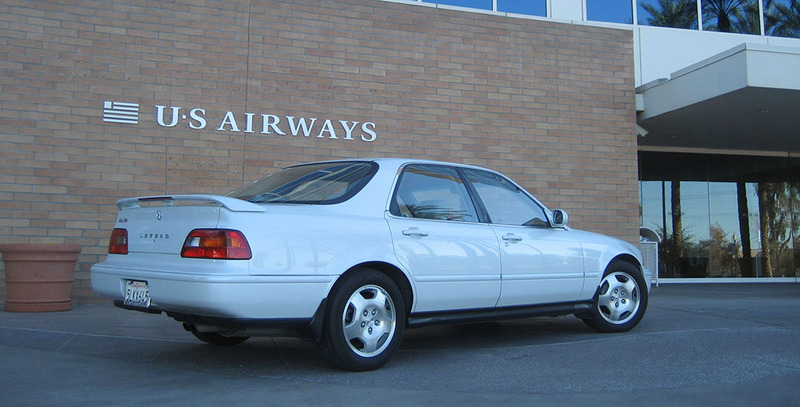 The 1992 model year marked the first year for the Prelude’s fourth generation. 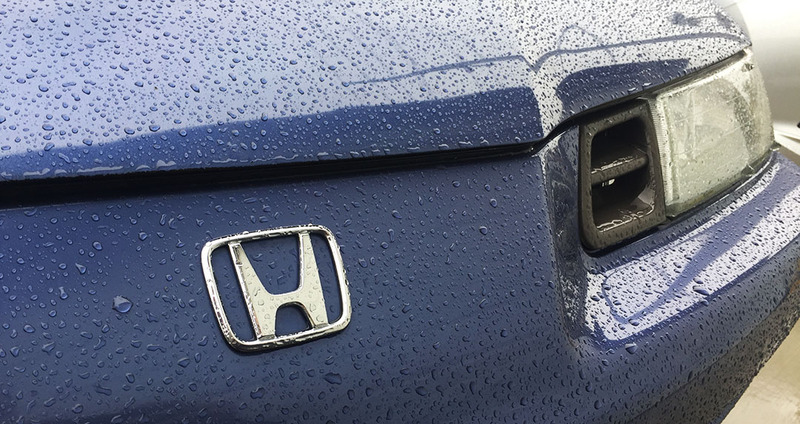 Body lines became much more rounded off as Honda departed from the boxy, pop-up-headlight-equipped 1988-1991 model year design that I’ve owned a few of. That futuristic layout continued on into the interior, where the instrument panel stretches across the entire width of the car with gauges housed in a narrow opening. The most beautiful thing about the Prelude, though, is something you can’t readily see. It’s that 5-speed transmission, so slick shifting you can flick it with a pinkie finger through all the gears. Honda’s engineering excellence really shines through when you get the Prelude out onto an onramp, just like I did when entering Highway 51 southbound. The audible and tangible feelings as the car revs to its 6,500 RPM redline are exactly why the Prelude was (and forever will be) a favorite of tuners. While the “H23” 2.3-liter powerplant puts out only 160 horsepower, it doesn’t matter. The car’s perfect sense of balance makes it an engaging driver, no matter the speed. From the moment I got behind the wheel, the car just felt “right.” Perhaps it’s because the car hails from an era that I’m so acutely familiar with (Honda and Acura products of the 1990s), but it took almost zero time to get comfortable in that supportive bucket seat and to get an understanding of how the controls and features operated. That’s something I definitely miss in new cars today: The simplicity of an engine, a transmission, and an open road without a dozen computers deciding how I need to drive or even taking over control for me. I thank Steve for his hospitality in allowing me a few minutes behind the wheel of his new ride! 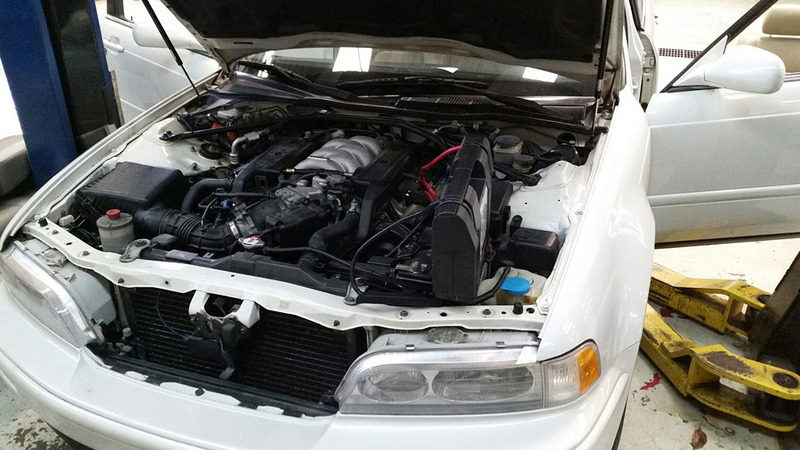 Integra is getting a new radiator this week, and I happened to park nose-to-nose with a Civic CX at the mechanic. It was January 2007. I had just finished up graduate school of Thunderbird School of Global Management and I wanted to reward myself with something special. 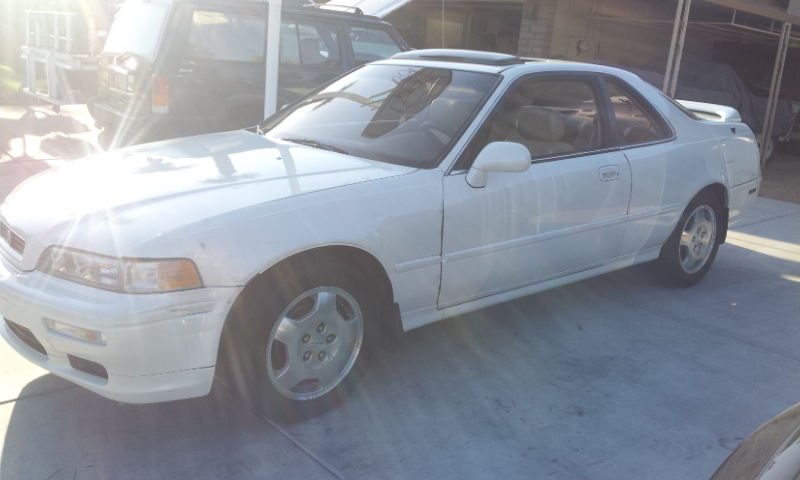 Posted on craigslist, I found a cream puff of a car in southern California that fit the bill perfectly: a Sirius White Pearl 1994 Acura Legend GS sedan 6-speed. Having owned my Legend coupe for about 4 years, I felt ready to expand the fleet a little. Now, I’d already owned a couple of other Legends in the past but this one was special because of its ownership history & condition. The below pictures from the online listing stole my heart. 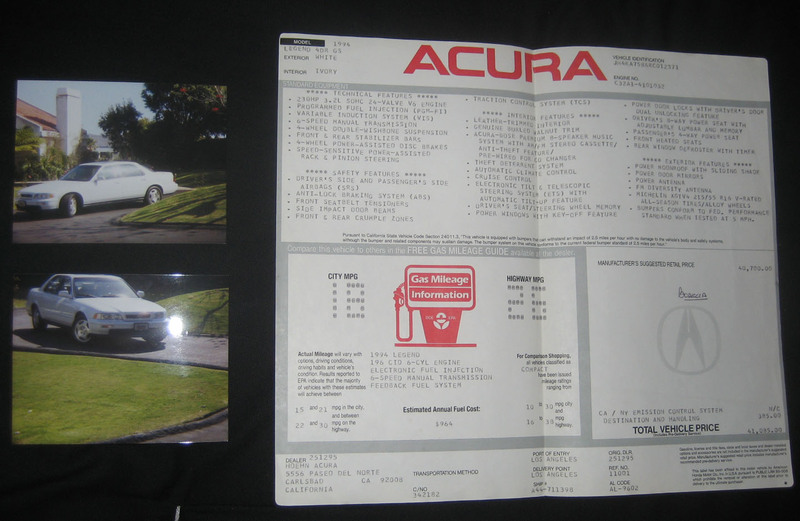 The seller, Simon, had even installed the car’s original “Hoehn Acura” license plates for the pictures. He informed me that his mother Lorraine, the original owner, had named the car Bodecia. She had traveled frequently between Carlsbad, California and her cabin in Oregon and thus the car had over 200,000 miles on it at the time of listing but didn’t look even a year old. On January 15th, I flew from Phoenix to Orange County airport and took delivery of the Legend at 207,100 miles from Simon. 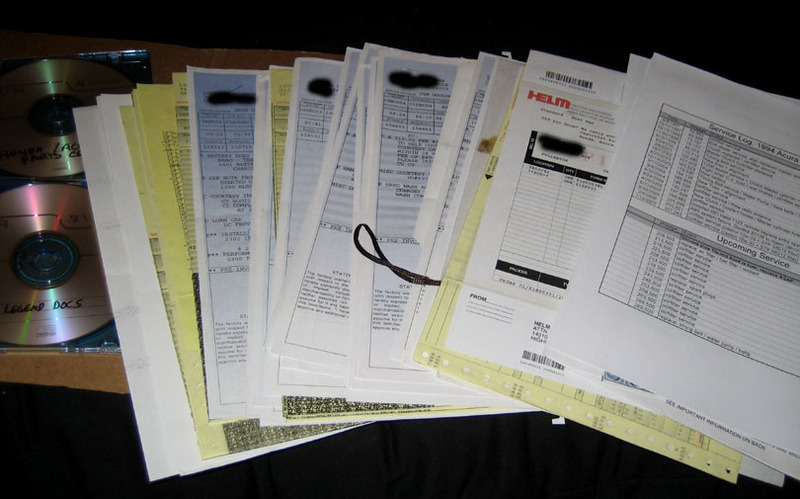 He gave me every single stitch of paperwork on the car – one of the most complete records I’ve ever seen. Notice he’d even given me a CD with the maintenance records digitized. This guy was over the top, and I loved it. Icing on the cake was getting ahold of the original window sticker AND a couple of pictures from when the car was brand new. Starting odometer reading when I took delivery. Back in Phoenix and meeting its coupe sibling for the first time. It was at this same time that I got my first “real” job. 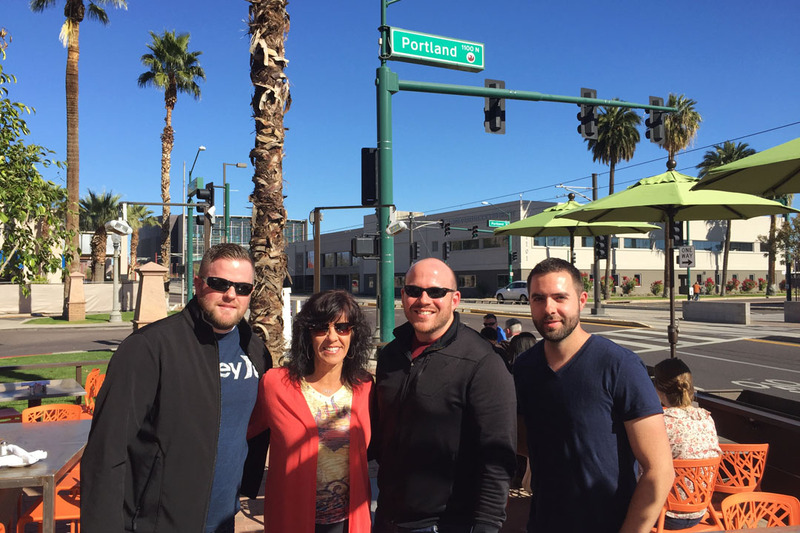 I was working at the US Airways main office in Tempe, Arizona on the Domestic Pricing team. I was the guy who you either loved or hated when you got online to check airfares. I exchanged several emails around that time with the original owner Lorraine. She was a sweet lady. Here’s her message dated May 14, 2007. It makes me want to cry to see how beautiful Bodecia looks. Thank you for the pictures. Here’s the story how I chose her. I had, at that time, a white 1980 Mazda RX 7. She had a Weber carburetor, air horns, a straight through exhaust and a D-bar and a racing clutch because I blew the original clutch. You could hear her half a block away. I loved that car. Skip Gorman, Simon’s mentor, had worked on my car with all the add-ons and as Simon grew older, Simon put them on for me. So, one day, an old Legend gave me a run for my money on the on/off ramp from 52 on to 805. I was intrigued and followed this car till I found out what it was. I needed a sedan as my Nissan Maxima of 10 years was past its prime. So, I test drove the 1994 Legend. I loved it. Loved the 6 forward gears, I was trained to use gears to slow down not the brakes. I wanted white and they had to search for her. Bodecia was one of 5 white models in the USA at that time. She was loaded on a semi and shipped down to Carlsbad from Los Angeles, especially for me. So, she may be the only white pearl GS left of the 1994 GS models in USA. This was the first car I had paid for and chose for myself after my divorce and she meant the world to me. Simon called her OJC (old Japanese car) and that hurt and it hurt to see her at his house. I still think I love her better than my new car which is an automatic for when I really am a little old lady. Bodecia just has an air about her. She was a Legend so I picked the name Bodecia who was a British legend. She fought the Romans after her husband was killed in battle. Rallied her people but unfortunately they lost. You may see her on some of the old English coins, chariot, spear shield. So, you can imagine how happy I am to see Bodecia is getting the care she deserves. Congratulations on your Masters Degree. Quite a feat. Well done. I would love to meet you next time you are in California. Let me know. I am retired but babysit for my daughter in Yorba Linda and am a Senior Patrol Volunteer for the Encinitas Sheriff Department. I will definitely make time for you. Will mail off the window sticker tomorrow. Yes, I spell funny. I was born in Australia. 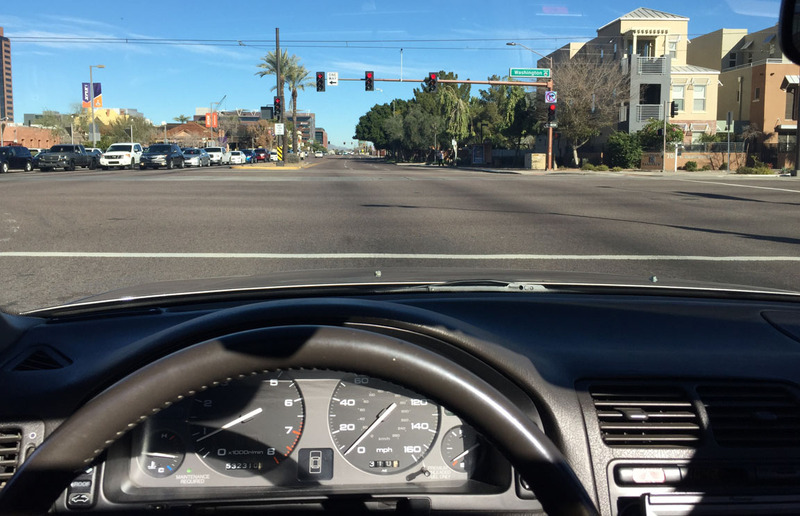 I owned the white Legend GS for fewer than 10 months, but in that one short span of ownership, I had so much fun with the car, some of which I’ve already shared on the blog. Here are a few other pictures of memorable occasions. 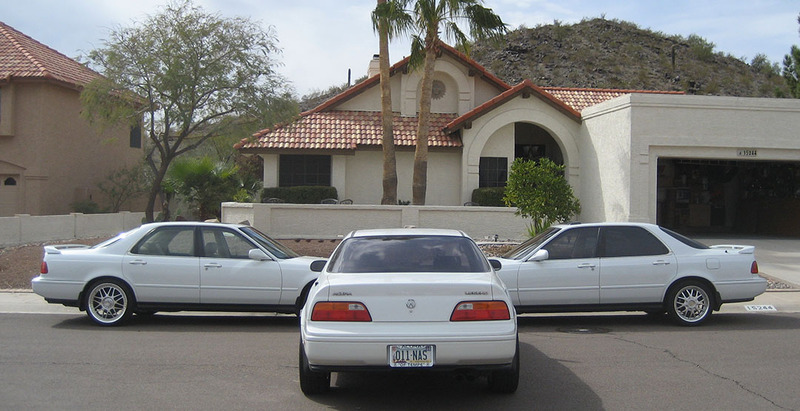 February 2007 – Sirius White Pearl block party at Chuck’s house, with his 1993 LS coupe and 1993 LS sedan. Neighbors were rolling their eyes I’m sure! 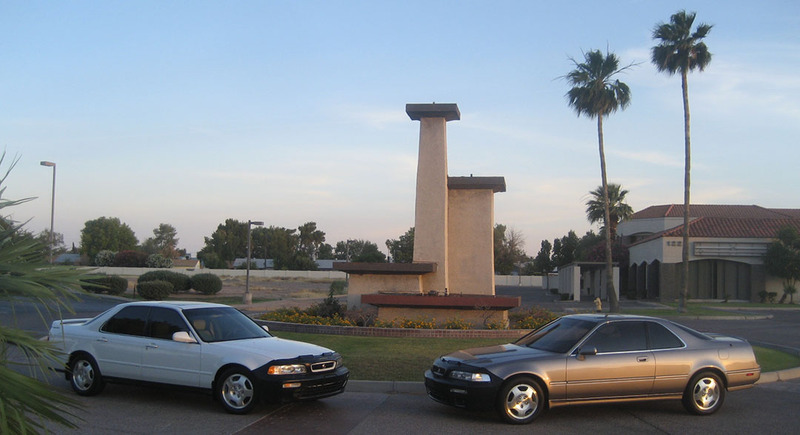 May 2007 – Legend 6-speed photoshoot near the home I was renting in Tempe, Arizona. August 2007 – The sedan had become my daily driver while the coupe was being repaired from a couple of deer collisions. I took advantage of an amazing sunset one evening in the parking lot of the Arizona State University football stadium in Tempe. On October 1, I was ready to sell the car. 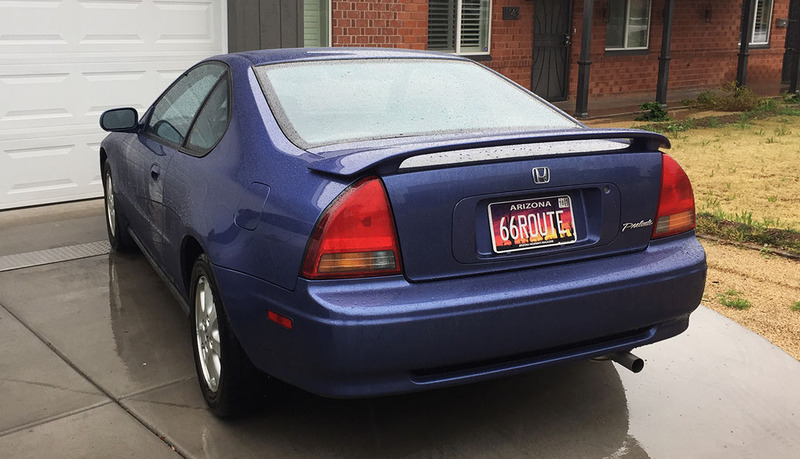 The coupe was coming back from the body shop, I had picked up a 3rd car (1991 Honda Prelude 4WS) that was sucking a lot of my attention away — plus I had limited parking space at my rental home. 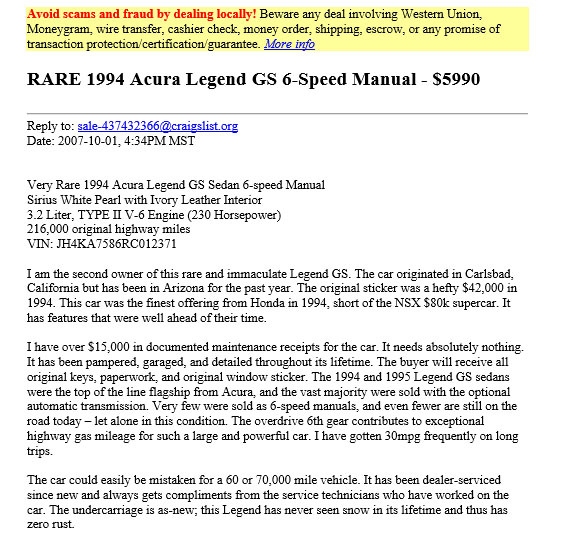 So, with great hesitance I posted the ad for the car with 216,000 miles for $5,990 on craigslist. My advertisement was several pages long and had at least a dozen detailed pictures. I also included a screen shot of the maintenance records Excel file. 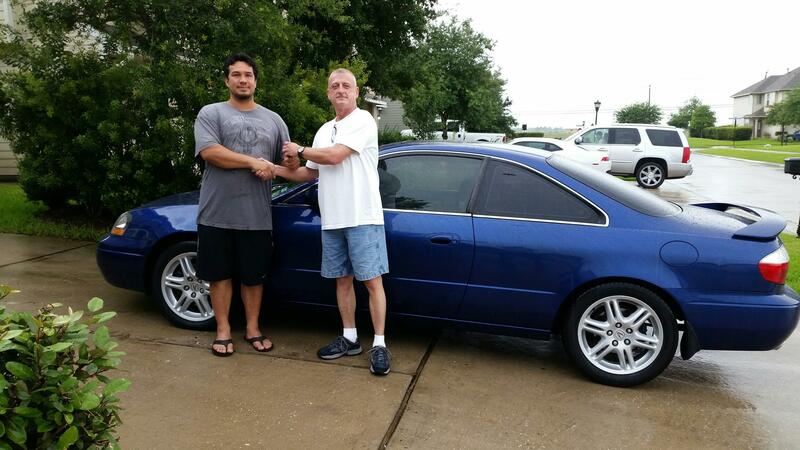 On October 26th, long-time friend of mine Wayne flew from Houston to take delivery of the car. 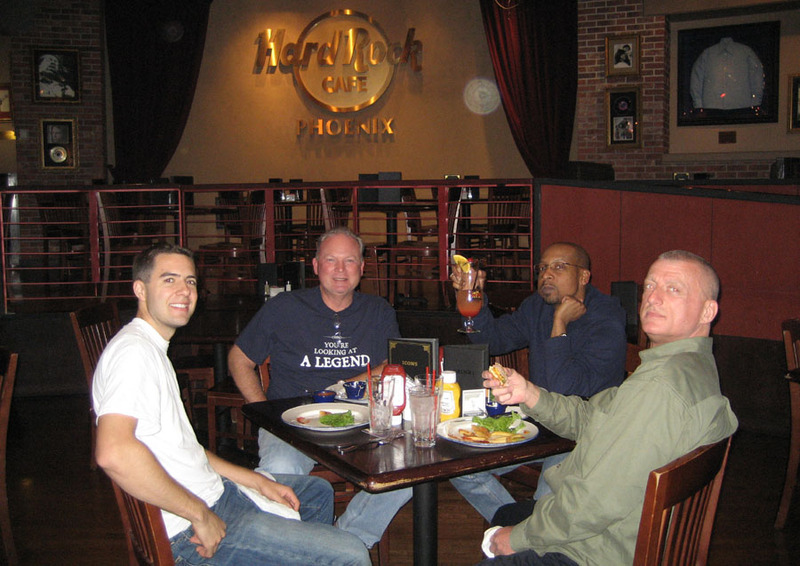 We took the opportunity to rally another Legend lover, Chuck, for dinner in central Phoenix at Hard Rock Cafe when Wayne and his friend Terrell were in town. Tyson, Wayne, Chuck, in the parking garage before heading out. 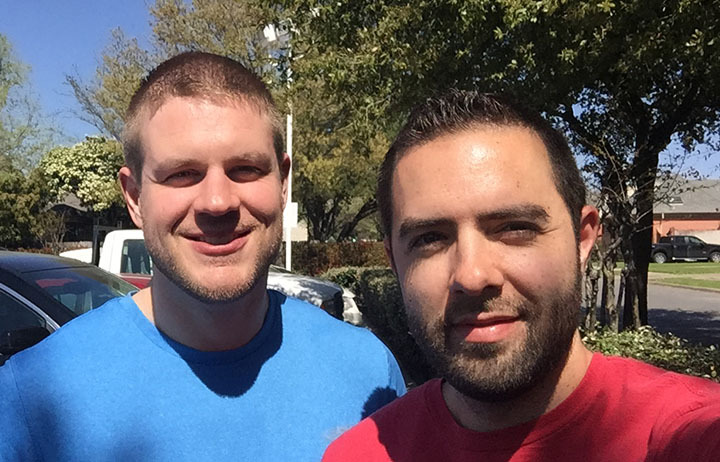 Wayne and Terrell made the 1,176-mile drive home to Houston the following morning. Not long afterward, Wayne sent me this picture of the car wearing its newly-issued Texas license plates. For many years (nearly 8, in fact) Wayne lovingly cared for the Legend with regular maintenance. Then tragedy struck in May 2015. The Houston area was pummeled with rain and most of the city went underwater, including the garage where Wayne had his Legend stored. Despite efforts to bring it back to life, the car was pronounced a total loss as the water had become too deep. 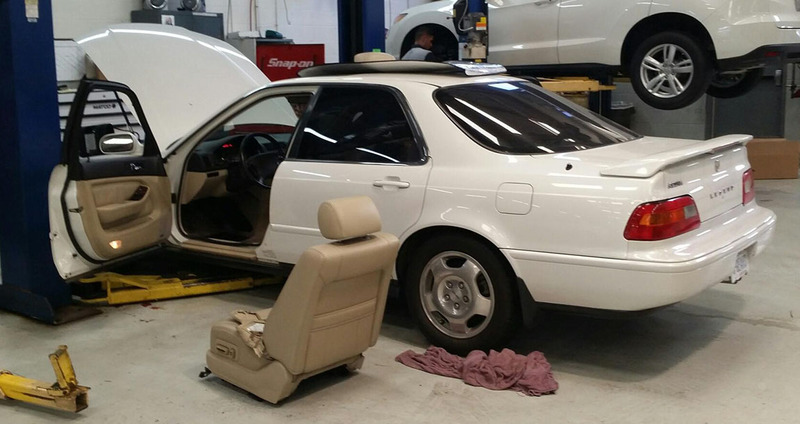 Sterling McCall Acura technicians delivered the somber news. These are photos from the car as it sat while drying out in the service bay. 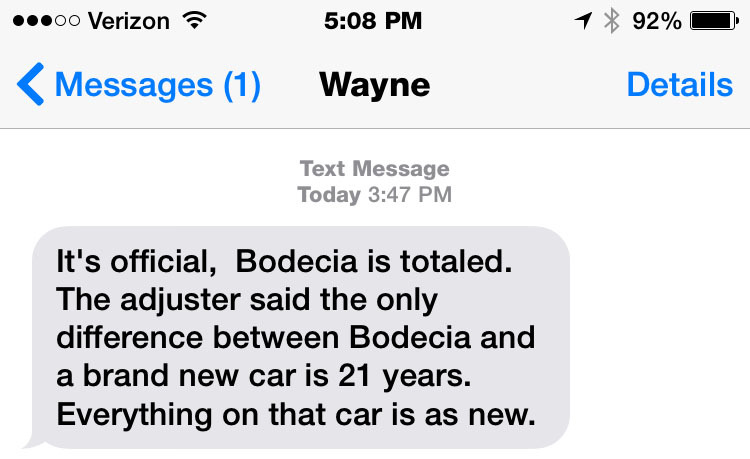 And this was the news I received from Wayne regarding the insurance company’s decision. At 220,439 miles, this Legend was merely broken in and still had a lot of life to live. Post your condolences for Wayne in the comments box, and let’s hope he can find another replacement car soon. Thanks, Wayne, for letting me share your story! Wayne has already found a worthy replacement for his Legend. 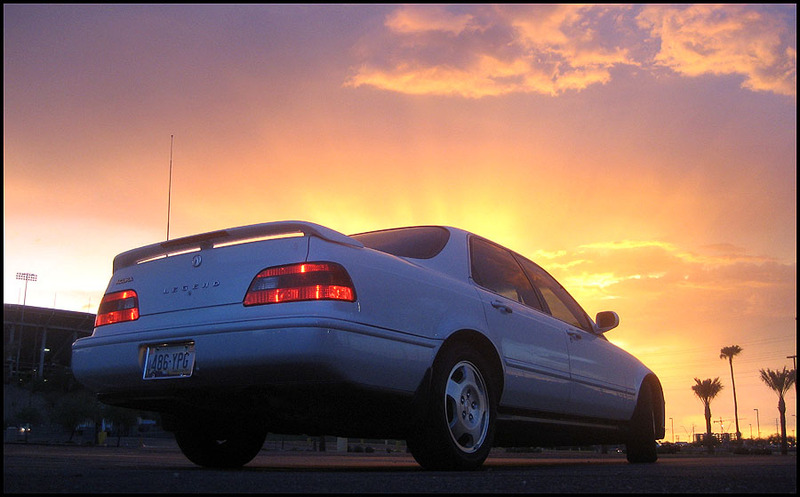 He is the proud owner of a 2003 Acura CL Type-S 6-Speed manual. 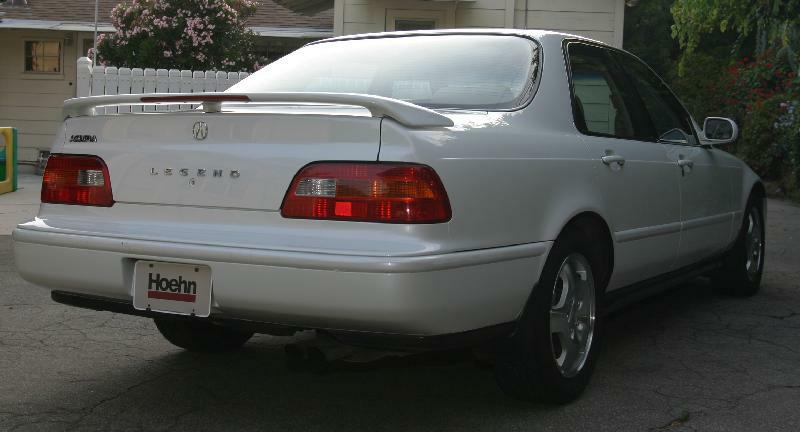 As most of you Acura fans will know, the CL 6MT is an extremely rare find. His is an Aegean Blue Pearl model, one of only 230 ever produced. 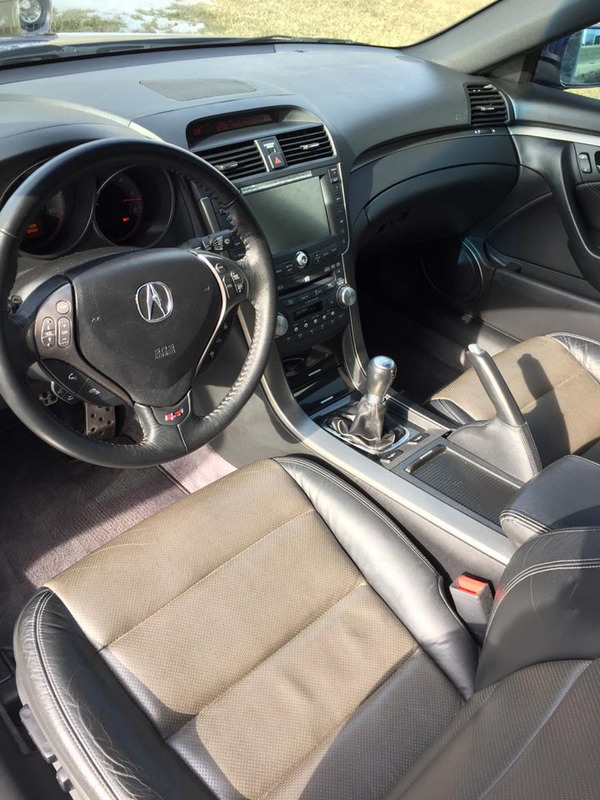 2003 was the only model year to offer a stick shift in the 2nd gen Acura CL. 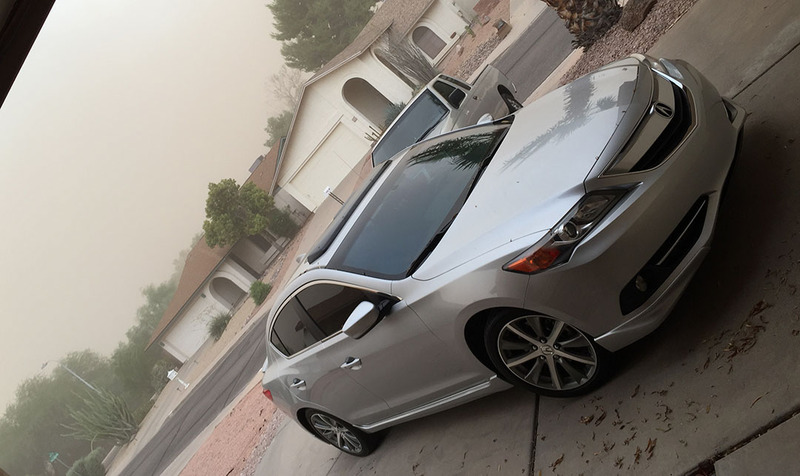 The ILX enduring a desert sandstorm just moments after I’d finished washing it. 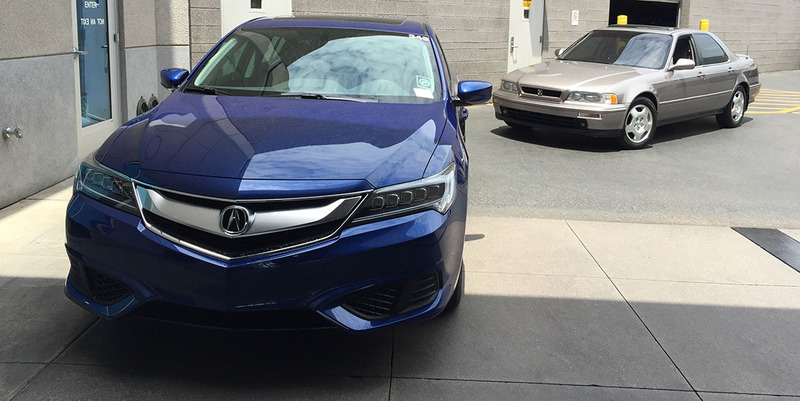 The Legend sedan getting an oil change on Saturday and parked next to a 2016 ILX. A congrats to my friend Jimmy on picking up a Legend. 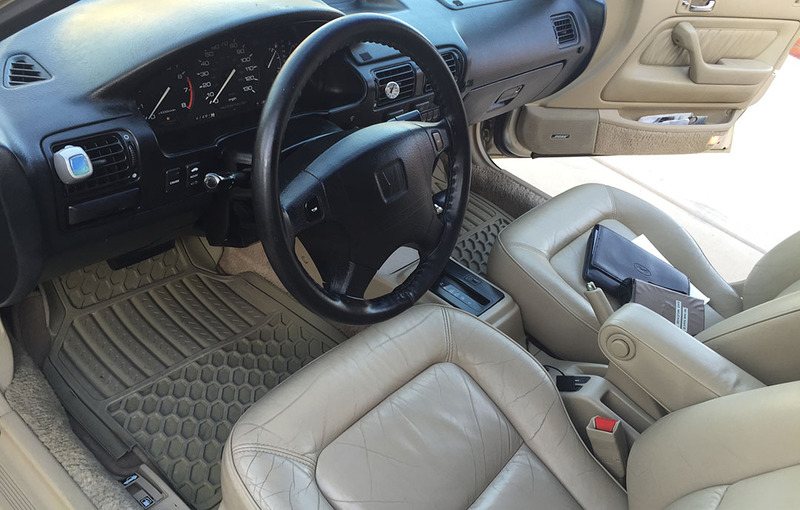 He got this 1994 GS 6-Speed with 166,048 miles on it recently. I took a test drive. And a shot from a Sunday drive in the NSX. Even at 8:00 a.m. the heat was unbearable. I need to get the A/C fixed in that car. Oh, and that’s the 62-foot-long “America’s Largest Sundial” in Carefree, AZ that I’ve blogged about before. I watched an interview with Irv Gordon a few months ago, and he said that when he bought his now-famous Volvo, his first weekend was spent just driving his new car, and he put about 1500 miles on it between Friday and Monday. I did not really understand what he was saying until this past weekend. Now, I totally get it. 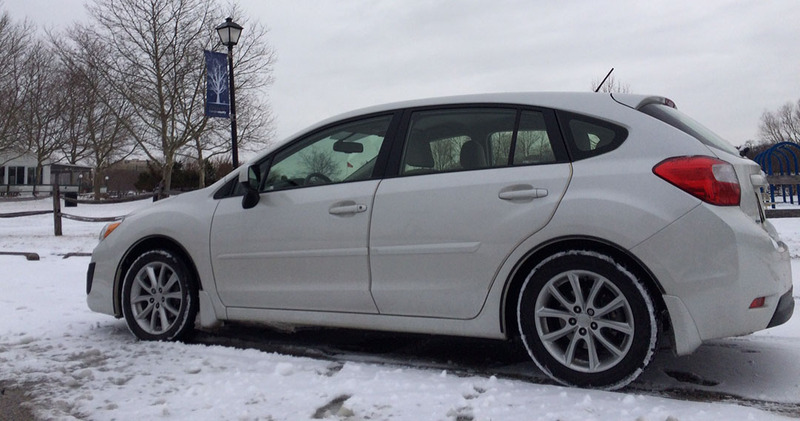 I owned a Subaru Impreza, and truthfully, I had been tiring of it for some time. The Subaru is a lot of fun in the snow. Unfortunately, it’s not as much fun any other time. It is light and boxy, so it doesn’t handle crosswinds well. You feel the road surface too much, and I have to spend a lot of time correcting the steering as I drive. The alignment is fine and the wheels are balanced, but it’s just a small car that does not do long distances well. I’d arrive at my destinations exhausted. I frequently take trips to Boston, and I’d be a wreck by the time I got there. I knew I wanted something different. And I missed Honda. 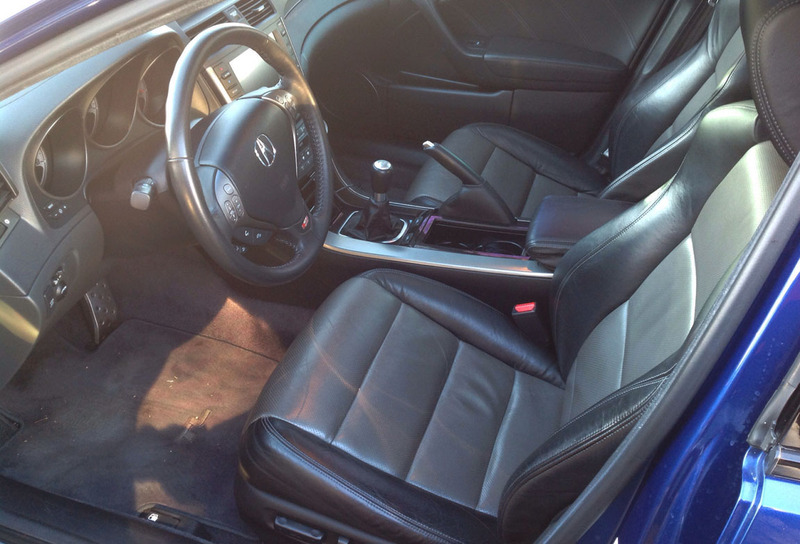 I had owned Hondas for almost twenty years, and my uncle had bought my previous car, a 2003 Accord coupe. Whenever I would see him, I’d ask if I could drive my old car. I missed the responsiveness of the Honda V6. I missed the smooth ride that could also handle the twisty stuff. I missed the H on the wheel (no, seriously). So I looked online at the used inventory at my local Honda dealer, Burns Honda in Marlton, NJ. I’ve always had good customer service experiences there. I bought two cars from them over the years, and also had them do all my servicing. I spotted a listing for a white Accord V6 coupe, 2010, with 50,000 miles, so Monday I went to check it out after work. To my surprise, it was already sold. The salesman showed me a red 4-cylinder Accord coupe (2012, I think) that I test drove. It was nice, but it was not what I wanted. I also test drove a 2013 Honda Sport, which disappointed me (see below). I really did not find anything that I wanted on the lot. So I was standing in the dealer’s lot, trying to convince myself to keep an open mind and perhaps consider the red coupe when the white Accord I wanted drove past, a big “SOLD” sign hanging from the rear view mirror. It was being taken to the service bay for final prep before delivery to its new owner. I watched it go past, longingly. The salesman saw my expression and said,”Hey, listen, we get these in from time to time. If you want, I’ll call you when we get another V6 Accord coupe on the lot.” I left, disappointed. I work for a university as an administrator. Thursday I had an all-day meeting on campus. It was a really productive meeting, but honestly, my brain was focused on checking out the Accord. As soon as the meeting was over, I got in my Impreza and drove as fast as I legally could down the NJ Turnpike to get to the dealer. I checked in with the salesman, and he walked me over to an absolutely filthy gray Accord coupe. I mean, forget parking under a tree. This car looked like it had been parked in a forest and left there. “We can clean that! You’ll see! It will look like a different car!” the salesman exclaimed, reading my facial expression. 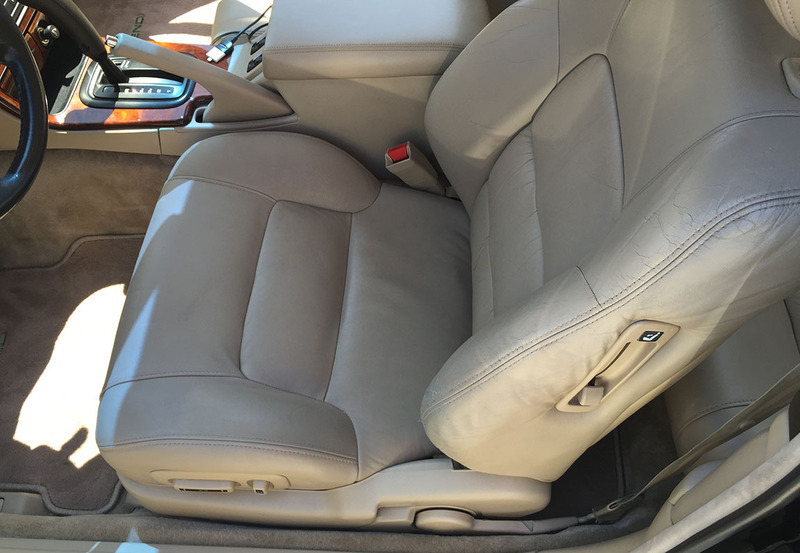 I looked under the dirt, leaves, sap, and everything else, and I saw that there were no major dents (a few dings here and there, but that happens), the paint was intact, and the carpets and upholstery were in great shape. I took it for a test drive…. two years with an Impreza and its dinky little flat-four engine, I had forgotten the joys of VTEC and the Honda V6. Wow. Just wow. I loved the test drive and knew that, barring any major problems with the deal, this would be my next car. We went back to the salesman’s desk and hammered out a deal within fifteen minutes. I got what I felt was a fair price on the car and a fair price for my trade-in. I had done research on what both of those figures should be, and the dealership’s initial offer was actually pretty close to what I wanted. It just took a few minutes of talking to finalize a deal that satisfied me. The only problem was that because it was after five o’clock, and the car needed significant preparation, I wouldn’t be able to pick it up until Friday. 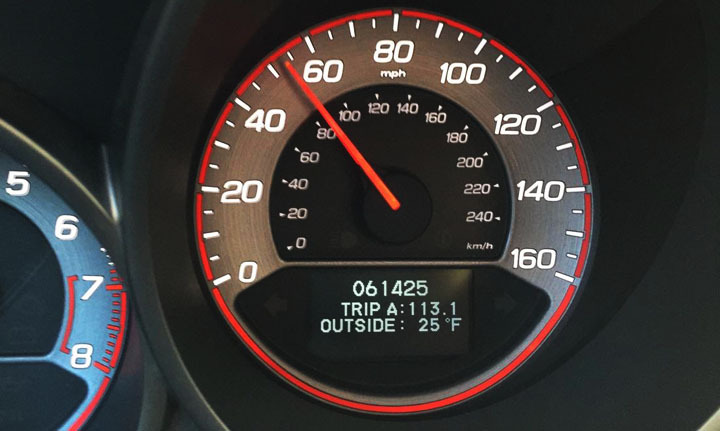 I left the dealership at 7:00 pm, with a plan to pick the car up at 3:30 pm the next day. Talk about an agonizing 18.5 hours! I barely slept Thursday night (I was really excited, what can I say). It didn’t help that the dealership gave me a loaner Honda CR-V. Don’t get me wrong, I appreciated the loaner car, but a CR-V will never ever be confused with a sports car. Anyway, at work on Friday, I told my co-workers the news, and they were excited for me. I had them all laughing when I showed them the timer I had set on my iPhone. It was counting down until 3:30 pm. Every so often, someone would pop their head into my office to ask how much time until I got the car, and I would eagerly respond: “Four hours, thirteen minutes!” “Three hours, twenty-eight minutes!” “Two hours, seven minutes!” Finally, at 3:00 pm, I set out from work to go get my next car. Did you ever see the video for “Last Friday Night” by Katy Perry? Katy Perry’s character starts out as a socially awkward nerd, gets a makeover from her friend, and turns into a gorgeous girl who is the life of the party? That’s EXACTLY what it was like seeing my car, all cleaned up. It came out beautifully. They also did about $1200 worth of work to prepare it, including new brakes, a new tire, oil and transmission fluid changes, some repairs to the exhaust system, and some other minor items. After shaking hands with the salesman and getting the keys, I departed for the Jersey Shore. My family has a house near the town of Cape May, and we had a small gathering there Friday night. I think I giggled the entire drive to the shore. It’s about an hour and a half ride, and I spent the whole time driving with a big grin on my face. The power from the engine, the responsiveness of the chassis, the comfort of the ride… the car is content to be a long-distance cruiser, and then can instantly turn into a willing dance partner when I want to drive with some enthusiasm. Honestly, I started feeling like Ayrton Senna in the McLaren-Honda MP-4/4 on the streets of Monaco or the back straight of Hockenheim. It’s a beautiful car, too. Every time I come out to my car, I feel like I want to pinch myself,”Wait, that’s MY car?” Really, I’ve never had this visceral of a reaction to a car before. I’ve liked all my previous cars (even my Subaru). But this is love. This is a car I could easily keep for years and years, and not outgrow or lose my interest. And, as I said in my initial email to you, at the risk of sounding sappy, I feel like I came back home. At the time that I switched to Subaru, Tyson, I shared with you that I felt like Honda had lost some of its mojo. And I still think that there is a problem: Honda had a vibe in the 90’s and early 00’s that I do not feel like they have fully recovered. 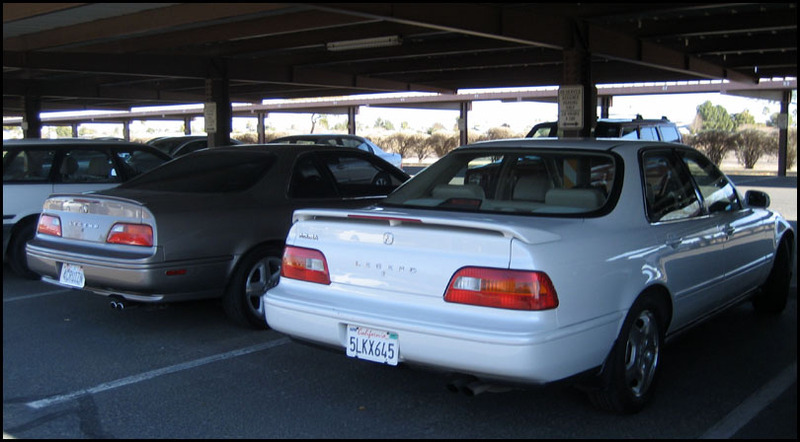 The Prelude, the S2000, the CL, the NSX, the Integra… all those cars are in the past. But this Accord coupe surprised me. It manages to channel a lot of that Honda-ness that I thought the company had lost. It’s sporty. The engine is a gem. It’s comfortable. Good fuel economy. It comes alive when it’s pushed. 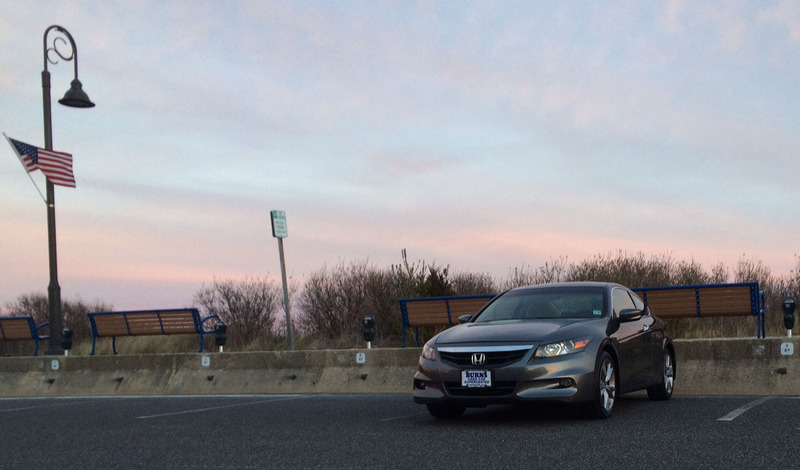 The Honda Accord Sport sedan I test drove was everything that is wrong with Honda- too big, too slow, too complicated. This Accord coupe, though, is everything that is right, and reminds me of the Hondas that I owned in the past. Just better. Anyway, thanks for reading my story. And it’s good to be home. Thanks again, Tim, for sharing this with us! And nice job on proper parking with that new Accord. It made my day yesterday to get this instant message from a coworker. He’d seen that instead of the ILX, my Legend was parked in my “regular” spot at the office. Let’s talk today about other people who take just as much pride in their cars as I do. I swear, my friend Josh’s TSX is immortal. His tried and true road warrior has endured many years of Idaho blizzards, varying road conditions, and now: Not one, but two “total loss” accidents. And it’s still running strong at around 450,000 miles on the original engine and transmission. Well, sort of. We’ll get to that in a minute. 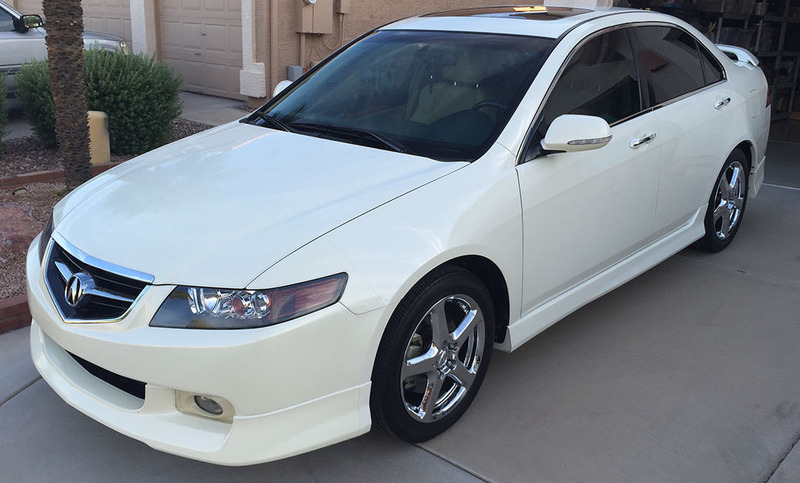 I first posted a feature on Josh’s then-375,000-mile 2005 TSX back in September 2013. Josh and I have since gotten together for tandem Acura road trips a couple of times including Shoshone Falls and Lowman, both in his home state of Idaho. All was well until just a couple of weeks ago when the TSX was again met with an unfortunate fate. Josh ran across a some fallen rock debris – and a deer – on a back road between Salmon and Boise, Idaho. The result was a tweaked suspension and an obliterated 17″ wheel – among a few other things. That story was featured here. At this time, the verdict is still out on whether Josh will continue his quest for 500,000 miles or let the TSX go. Pop on over to TSXTravels.com and give him a little encouragement if you get time. I wanted also also follow up and mention my good Legend-friend Mirel. 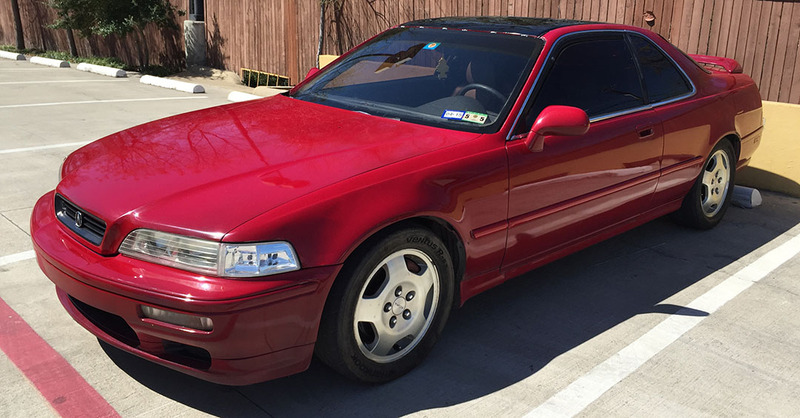 I introduced him to you in August 2013 when we talked about his near-mint condition 1993 Legend LS coupe 6-speed that he restored. Since then, he’s done it again…. and again. Mirel has a knack for finding “used up” Legends on craigslist and putting them back on the road where they belong. Here’s a thread on the Legend forums where he detailed the progress on his two most recent project cars. First off, his Cayman White 1995 Legend, before and after. It had sustained collision damage to the front left corner and required some suspension work, which Mirel performed himself. His wife is still driving this car on a daily basis. Getting some help from son & wife. 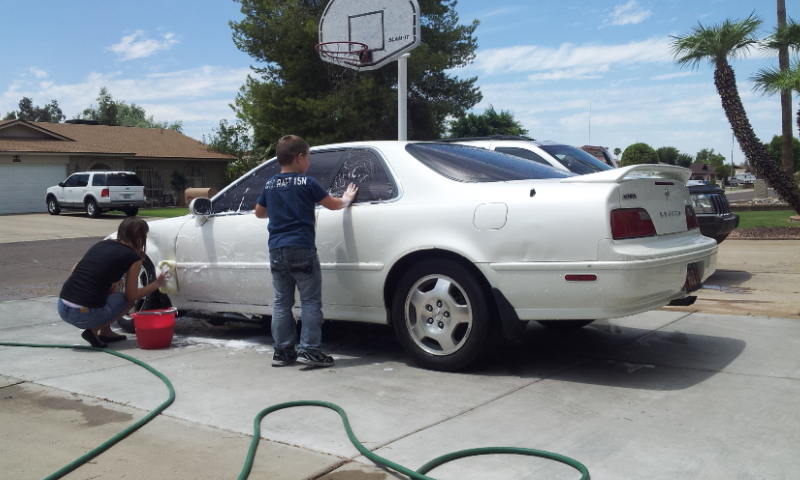 Acura love is a family deal around his house! After. For do-it-yourself body work (and until he has a real shop take care of it), it looks great! 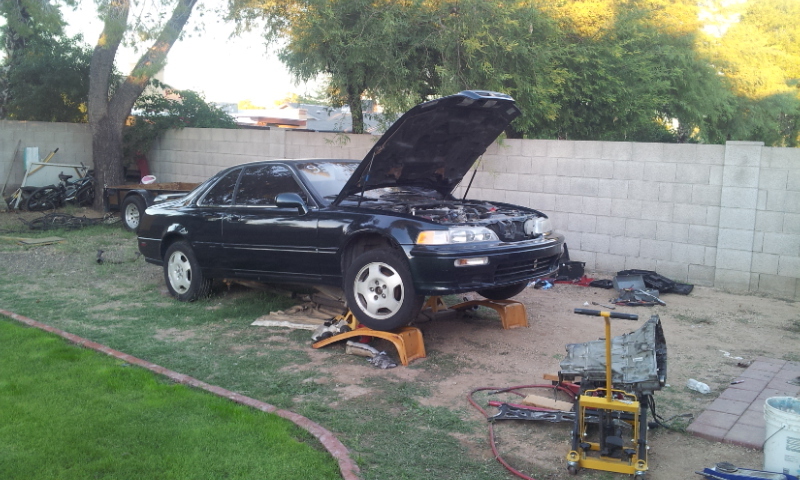 Mirel’s next project car was a Sherwood Green 1995 Legend that needed a new transmission. Mirel found a 6-speed transmission at the junkyard and swapped it into this car. After. It’s amazing what a detail job will do. He later sold this car, but not before taking a few pictures of his Legend collection at the house — and a black Acura RL (n0t seen) in the garage, too. Finally, we have a new feature on the blog, and it’s my friend Hy. He’s been driving Honda cars since the late 1980s when he bought his first 1989 Honda Accord SE-i. He later went on to buy a brand new 1993 Accord SE which he still has today. 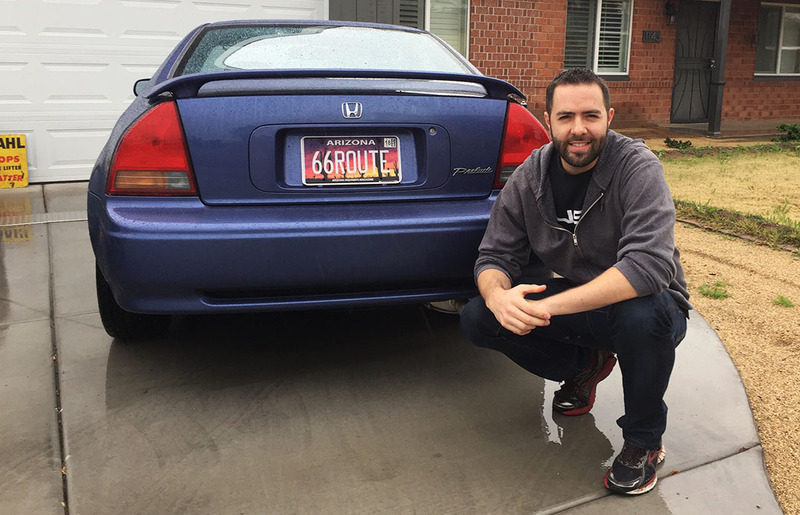 His wife drives a 2000 Accord V6 sedan, and Hy’s daily driver is a 2004 Acura TSX. Each of the cars is in absolute showroom condition. I visited his home last night and got a special preview. 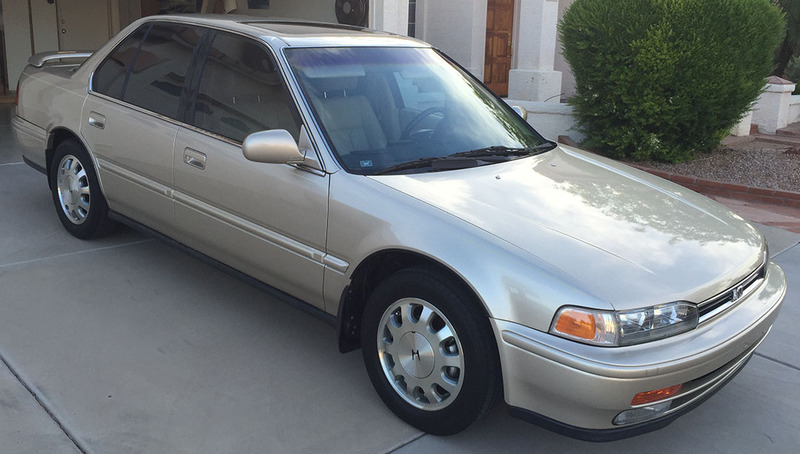 This Accord has been lovingly maintained since new, and it shows. It really looks and drives like a brand new car. 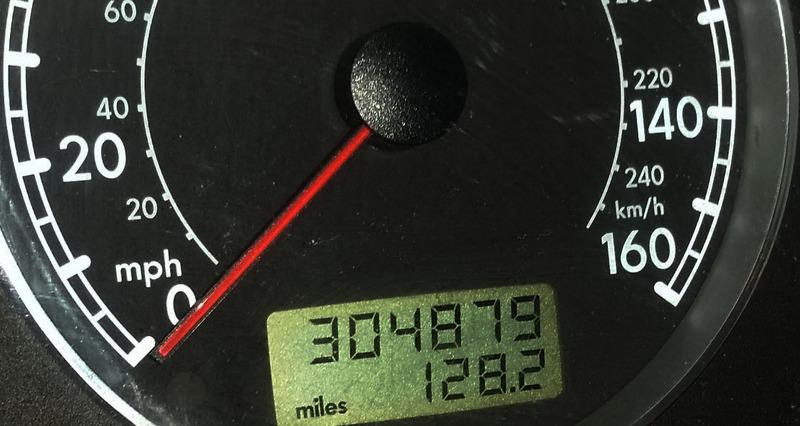 The current odometer reading is a little over 127,000 miles which comes out to only about 5,800 miles per year over the last 22 years. It’s lived in the Phoenix area its whole life. Hy told me that when he took delivery, it had just over 100 miles on the odometer. 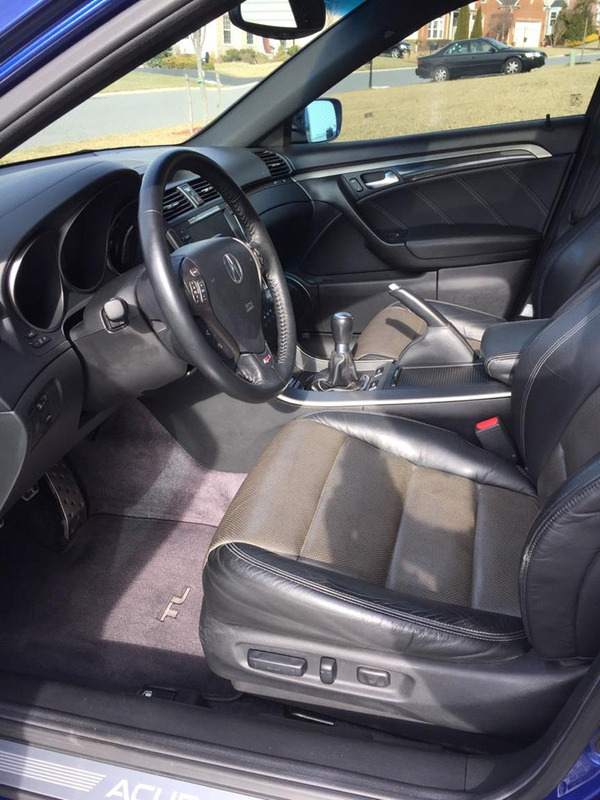 The interior is as nice as the rest of the car, with triple-stacked floor mats keeping the carpets immaculate. Even the engine bay looks clean enough to eat off of. 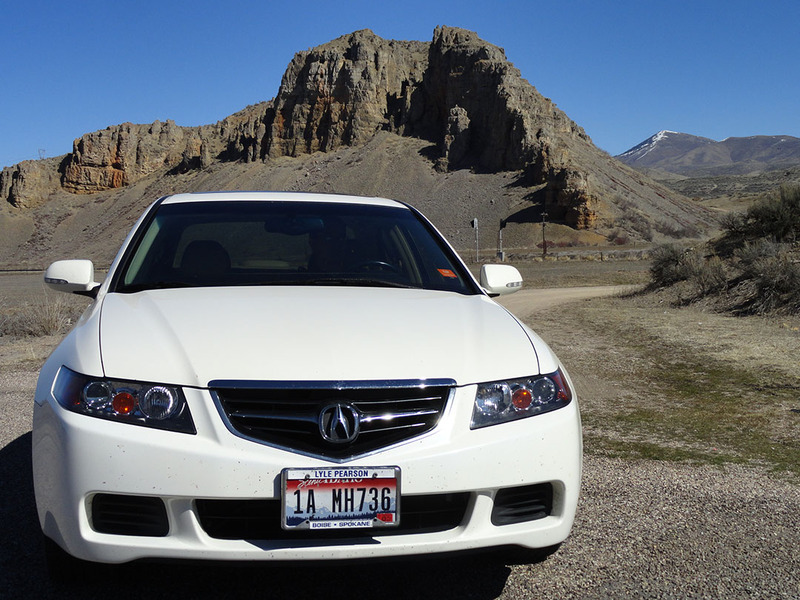 The other car – and Hy’s first Honda stick-shift product – is this 2004 Acura TSX in White Diamond Pearl. Hy liked the TSX when it first came out and he had a bit of a wait until the car was available. This example was built in June 2003. The interior is exceptional, as expected. This one has 60,012 miles on the odometer. Hy gave me the chance to drive both cars. The Accord sails along effortlessly. 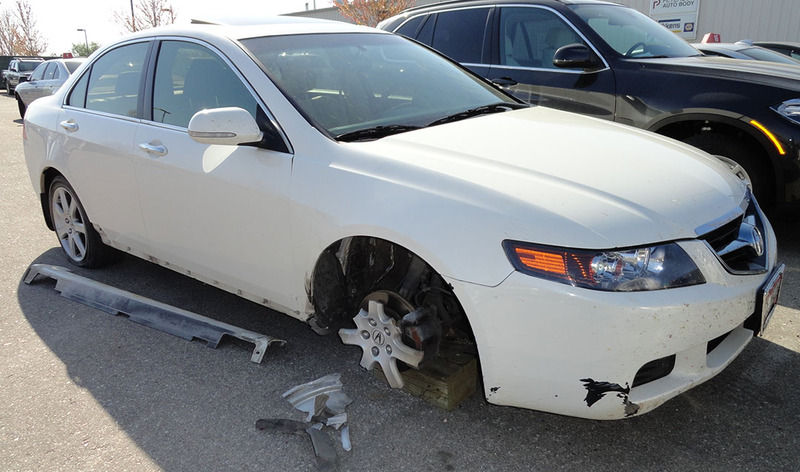 The TSX – I only made it about 6 feet before grazing the corner of a brick border around his planter and popping the right rear tire. Knucklehead of the year? That’s me. We installed the donut for now and Hy is getting a new Michelin installed. Doubt he’ll ever give me the keys again, but if he does, I want to go back over for a longer test drive for sure. Thanks, Hy, for the showroom tour! And thanks to all my readers who have shared their Honda and Acura love with me! 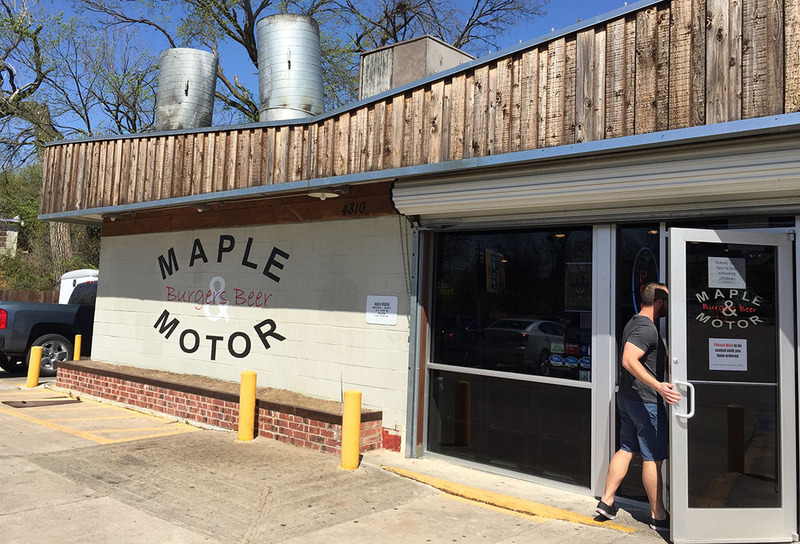 Among the many highlights of my 2,205-mile drive to Dallas, Texas and back this past weekend, I wanted to devote a special blog entry to an event that was especially fun for me. 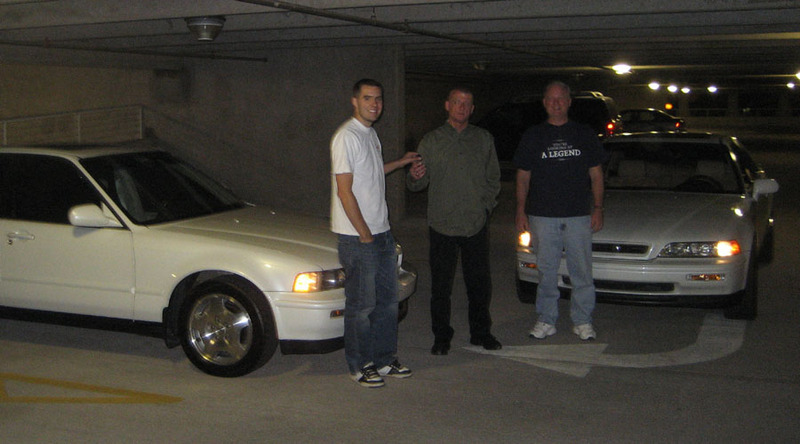 Having been a part of the online “Acura geek” community for over a decade now, I’ve done my fair share of networking. Today, I have car-enthusiast friends in every major city in the country. When I started putting together my plans to visit Texas, one of the first things I did was reach out to a few folks there to see if they’d be interested in meeting up. Turns out, they were. And they did. 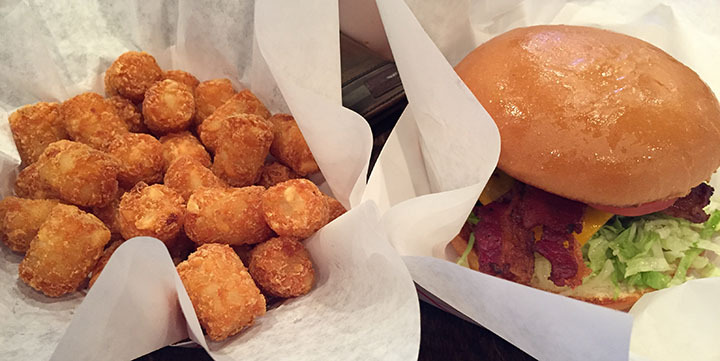 Seating was tight and the lunchtime crowd was bustling, but we were able to find a table fairly quickly for our party of 7 while we enjoyed a few minutes of car talk and delicious tater tots. 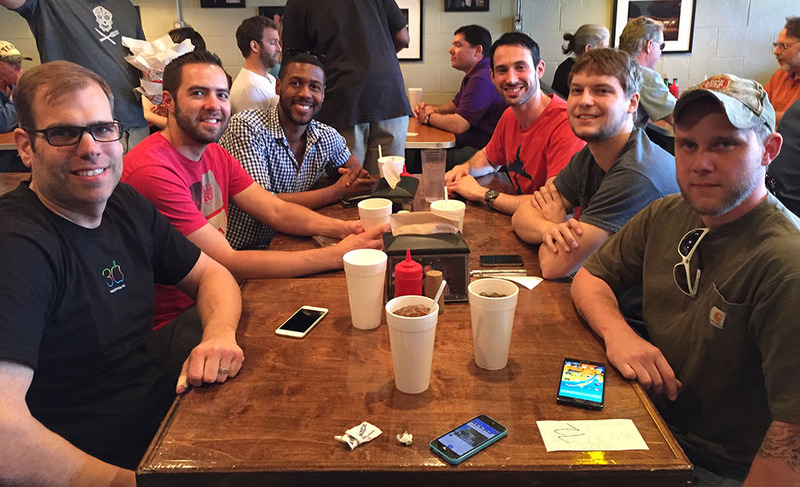 Pictured here from left to right are Marc, Tyson, Lance (Escalade), Scott (GS350), Blake, and TJ. Yes, we let a couple non-Legend people join us because they’re still fans. And thanks to Amanda for taking the picture. Here’s a little about the Acuras in our party. 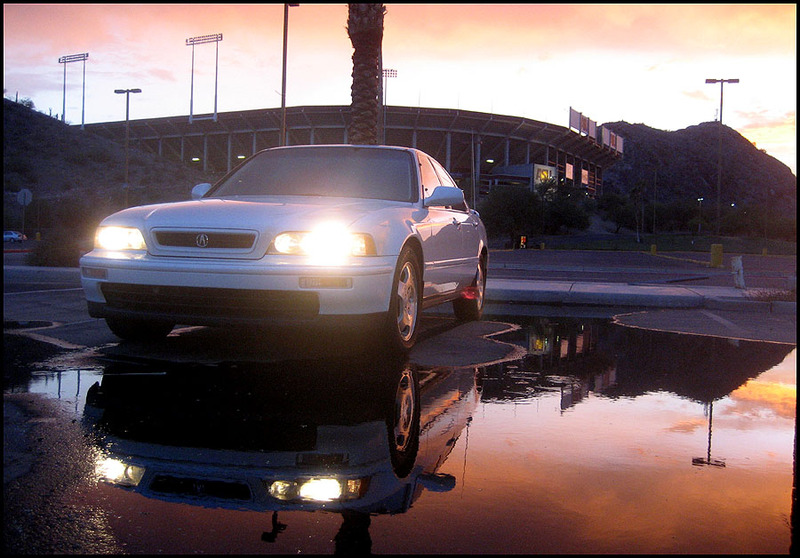 First off, this is Blake’s 1994 Legend LS coupe 6-speed. It was the first Milano Red LS coupe 6-speed on the production line that year. His car was the 805th Legend coupe built overall for the 1994 model year, and rolled off the line just 27 cars before mine. 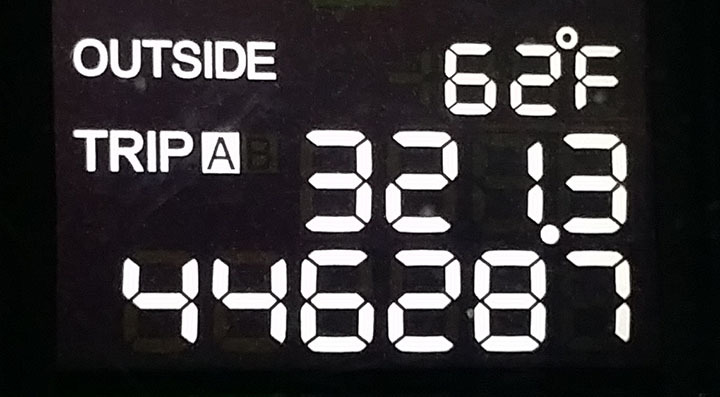 It’s nearly broken in at just over 1/4 million miles on the odometer, but you wouldn’t know it by taking a test drive. During my short spin around the block, I was impressed with its pick-up. This powerplant is 3.5 liter V6 with a performance air intake system and other upgrades. Blake has installed a custom Stromung exhaust system which gives the car a nice growl. 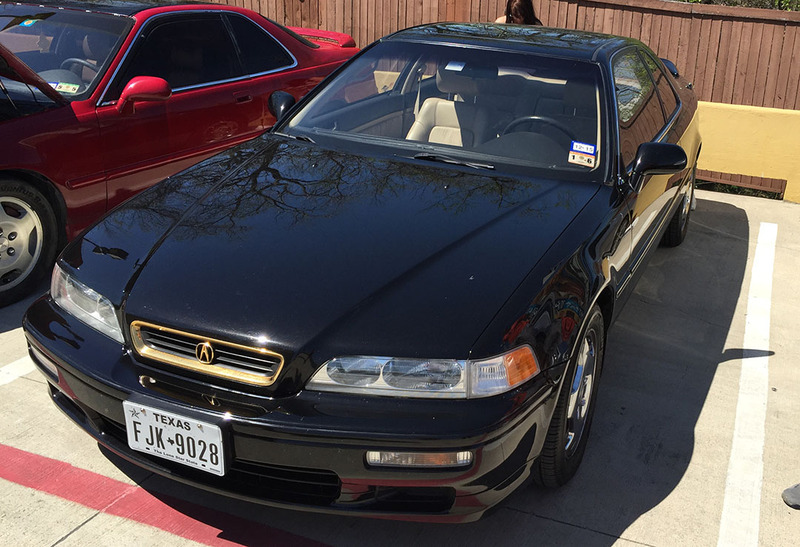 This showroom-fresh example is Marc’s Granada Black 1994 LS Automatic with special options like the OEM gold grille/emblems, chrome wheels, and spoiler. Marc recently snagged this gem from a California dealership and had it shipped sight-unseen to Texas. He has no regrets, and it’s a stunning example. It has traveled just 128,000 miles since new. I took a drive in this one, too, and it felt like going back in time two decades. It even smells great. 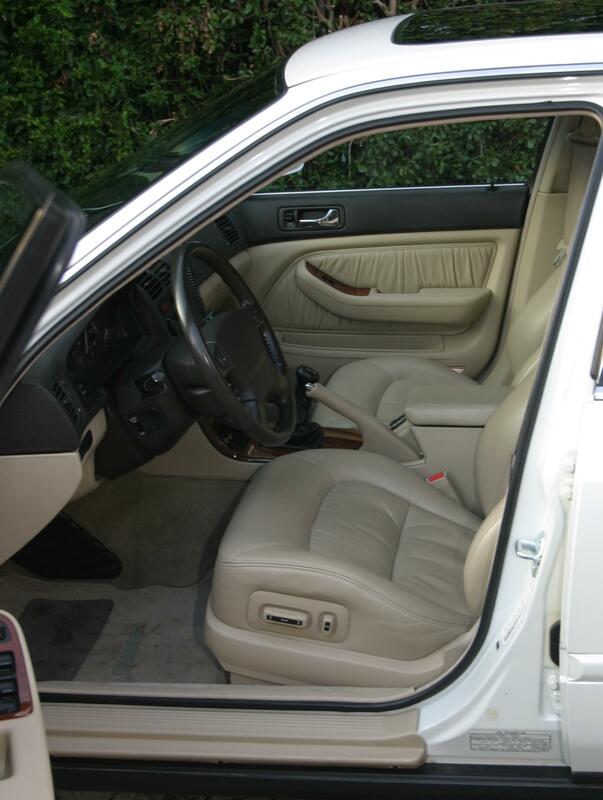 Not to mention that leather interior. Thanks, Marc and Blake for the test-drive opportunities! I look forward to seeing all of these people at this year’s National Acura Legend Meet (NALM) in Houston this coming September. My friend Randy didn’t make it to the Maple & Motor meet-up, but we caught up later over a Whataburger shake just up the road. 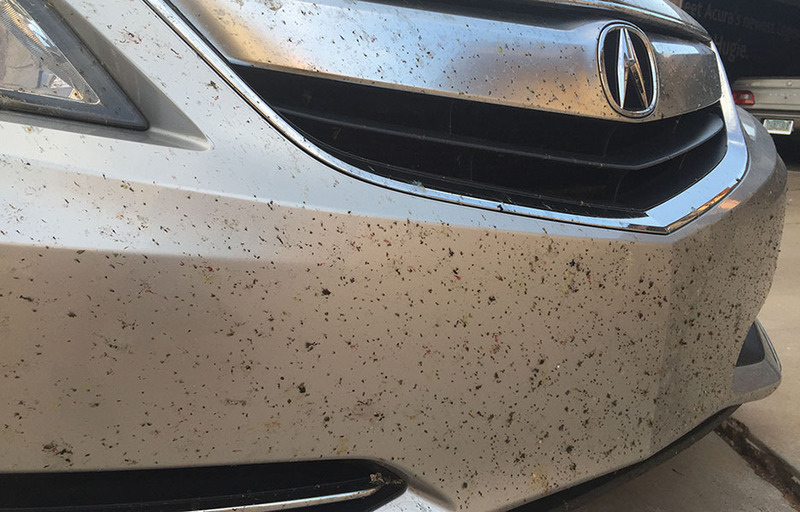 When the trip was all said and done, I had a lot of bugs to show for it. Thanks again for being a part of the adventure! For awhile now, I’ve had a not-so-secret obsession with the 3rd generation Acura TL “Type-S” that was offered in model years 2007 & 2008. I’ve always thought it’s one of Acura’s best designs and even today, 7+ years later, I break my neck trying to catch a glimpse every time I spy one out on the road. Apparently, I’m not alone. Why else would my friends Chris and Marc have each gone to such great lengths to seek out and buy such a car? Last month, Chris had his 2008 TL Type-S transported from Austin, Texas, to Baltimore, Maryland after a sight-unseen online purchase. 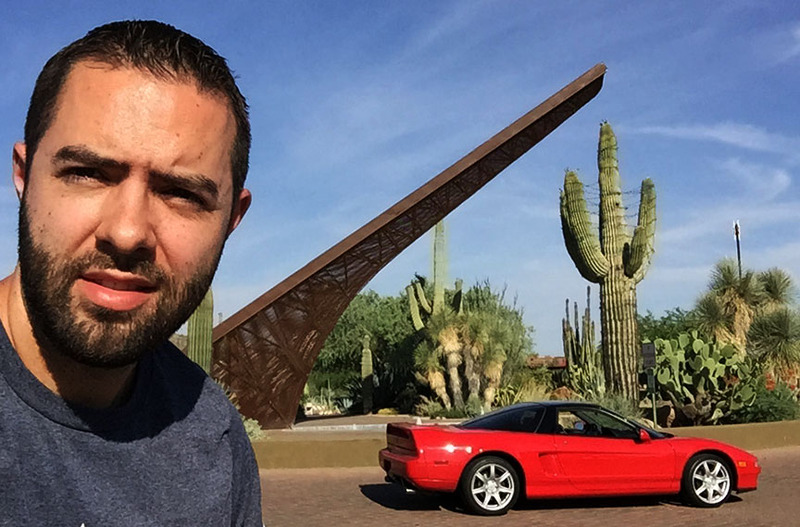 And last week, Marc flew to southern Florida and picked up his 2007 Type-S, only to immediately get in the car and drive it nearly 1,200 miles home to New Jersey. There is just something about these elusive Type-S 6-speeds that makes them that special. Chris’ neighbors in Havre de Grace, MD had a glimpse at an extremely rare sight last Friday when Marc paid a visit and the two “Kinetic Blue Pearl” TLs met for the first time. Head-to-head. A Texas car ends up in Maryland, and a Florida car ends up in New Jersey. These guys are making me want to join the KBP TL-S 6MT club (that’s a mouthful) in a big way. Nice looking rear ends. These TLs are powered by a 3.5 liter V6 that pushes out 286 horsepower. One of my favorite designs from Acura, ever. I suppose it’s only a matter of time until the TL-S “bug” gets the best of me and I join the club. I asked Chris to tell me a little about what makes his TL-S so special. When the 2004 TL came out, instantly fell in love with the exterior styling and the fit and finish of the interior. I couldn’t wait to hit my local auto show to sit inside one. 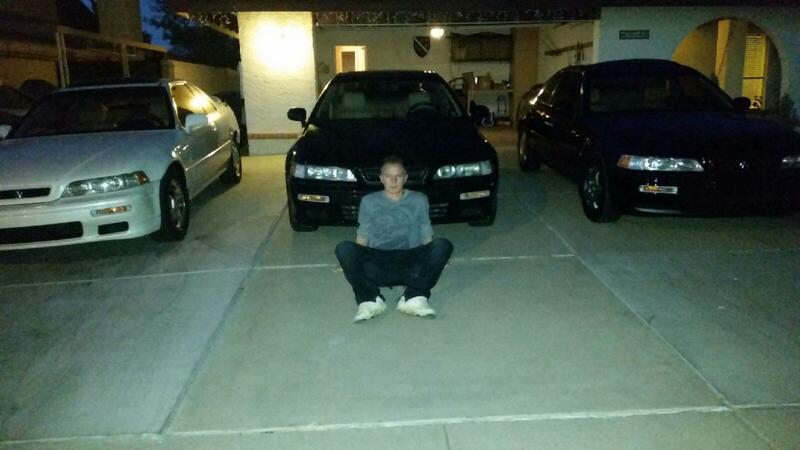 At the time I was content driving my somewhat rare 20th Anniversary Edition Nissan Maxima. 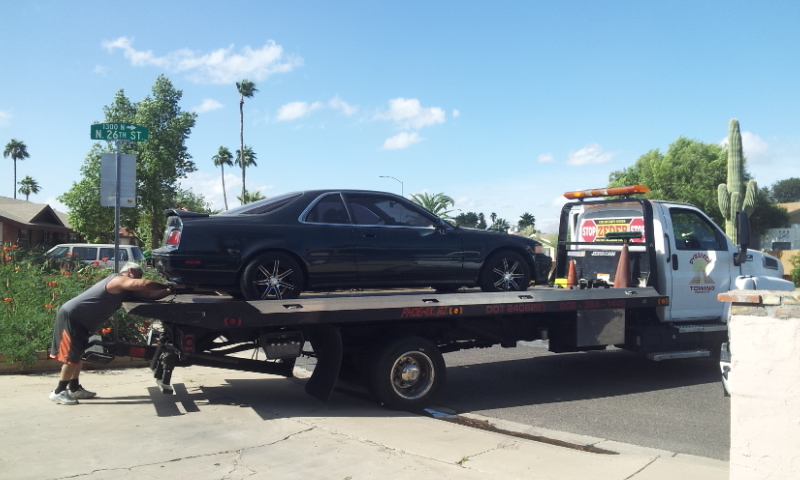 But I knew if something ever happened to that car, the TL would be the next one in my driveway. The icing on the cake was Acura’s offering of a 6-speed manual transmission. Seven years later, the Maxima was gone and it was a matter of time before I picked up another sports sedan. I knew the Type-S had returned for 2 years and was the model I had to have as I’ve only been interested in cars that are rare or harder to find. After spending months performing nationwide searches for a TL Type-S with a 6-speed manual, I noticed all the results were black, white, silver and carbon bronze; though I knew a blue and red one existed but they always seemed to be automatics. After reading numerous threads and research, the Kinetic Blue and Moroccan red were definitely the rarest colors equipped with a manual trans. I wasn’t a big fan of the red so it would have to be blue. After months of searching to no avail, a kinetic blue Pearl result finally popped up on Carmax with no photos as the ad was fresh. The mileage was incredibly low and knowing how rare these cars were I had to have it and bought it sight unseen. 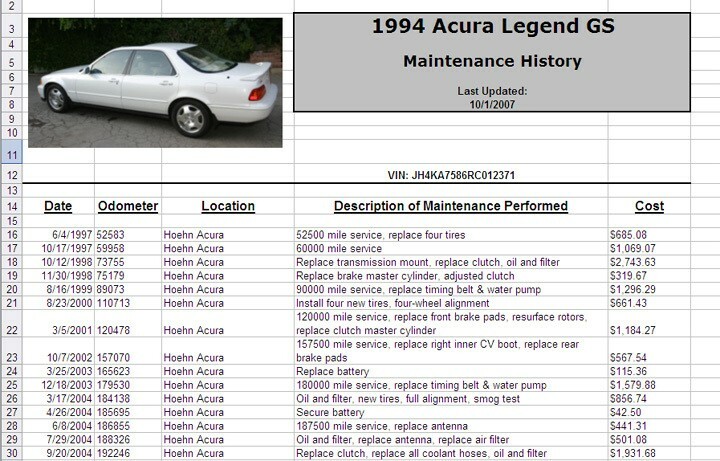 Luckily for me it was a one-owner with all Acura maintenance up to date and the factory A-Spec kit had been installed. I took delivery of a rare and near showroom quality car and couldn’t be happier with it. The 2007/8 TL Type-S had been on my wish list since first seeing them on the road when Acura brought back the Type-S model at that time (’07). 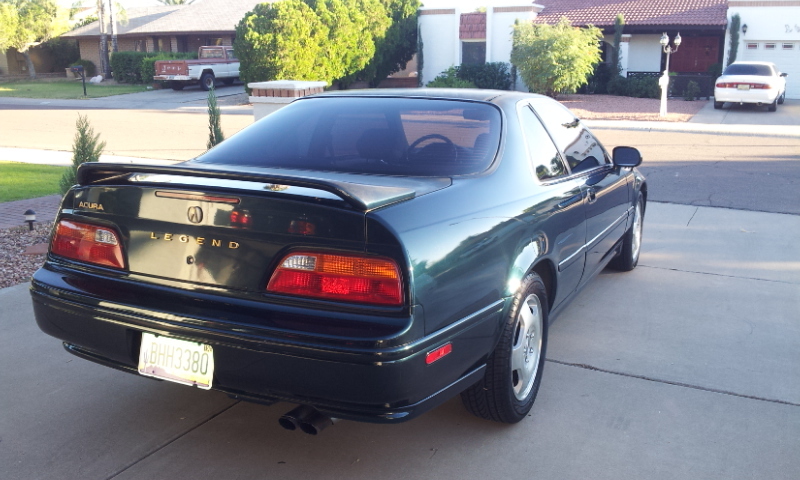 Very similar to back in the mid-90s and I would see 2nd gen legend coupes on the road and think how nice they looked. After seeing a Sherwood Green Legend LS coupe on a highway in Florida that looked stunning, I knew some day I would own one. At that time they were too costly for me. 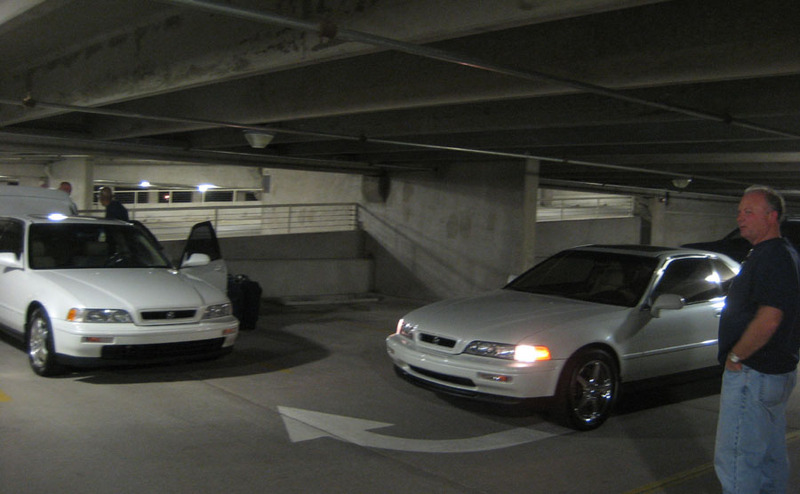 So fast forward to the years 2007-08 and my search ended in owning not just one but two low-mileage legend coupes that have essentially been garage queens. 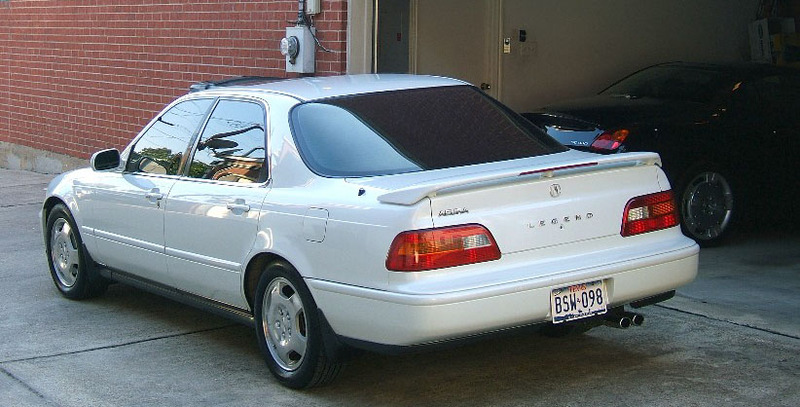 The 3rd gen TL-s was new to the road at this time and was a bit too costly for me. And I had the Legends now so I figured maybe a few years down the road… So fast forward to today and my daily driver car (an ’02 TLs) started to exhibit some of their notorious transmission failure symptoms. I started to look around for an 07/08 Type-S with 6 speed manual. Figuring the cars were now at 7-8 years old, prices are pretty reasonable. Unfortunately, much like trying to find a well-cared-for and clean manual Legend coupe, the same holds true for the TLs. I found a couple local ones with higher miles, but test drives proved they may not have had an easy life. I had always really like the Kinetic Blue Pearl color, but I was leaning now towards a White Diamond Pearl with black/gray interior. 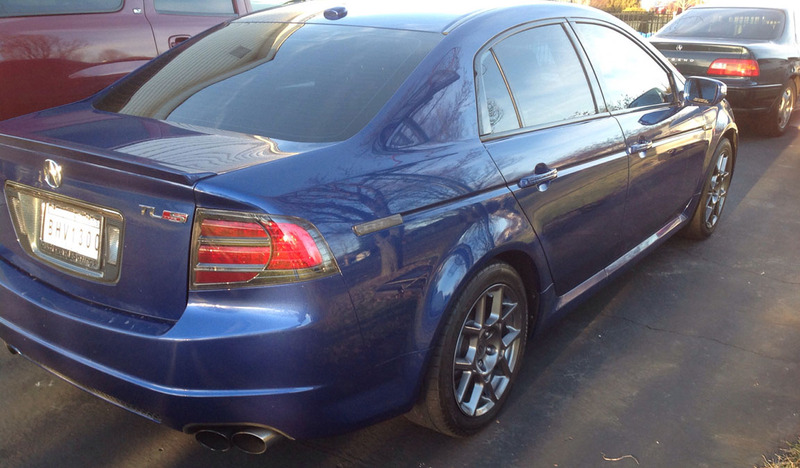 Right after the New Year I come across a 2007 Kinetic Blue Pearl just listed on a popular auto classified site. This color combo with the two-tone black/gray with 6MT is becoming pretty scarce. It was traded in at an Audi dealer in south Florida. At first look, the mileage was high at 174k so my first thought was it was too many miles and too far away. 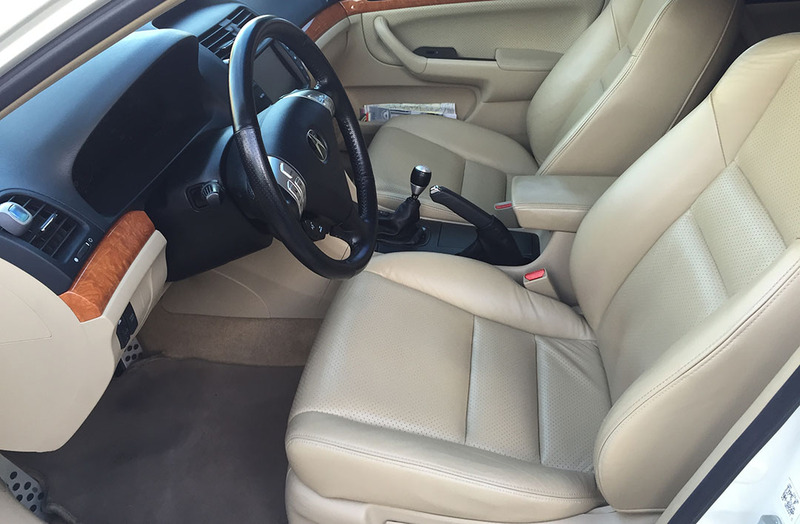 But at closer examination, the pictures revealed a very clean car. Then looking at the Carfax report, it revealed an extremely well-maintained car — one that had been to the dealer for every required service. And I also find out it was a one owner and by a gentleman in his 50s. Things start to sound intriguing as I figure the car also has likely been racking up these miles on the smooth, pothole free, unsalted roads of Florida. One thing leads to another, I figure it was worth the risk of buying a cheap one-way ticket to Florida and drive the car over 1300 miles back to NJ. Fortunately my intuition proved correct and the drive home was a blast. 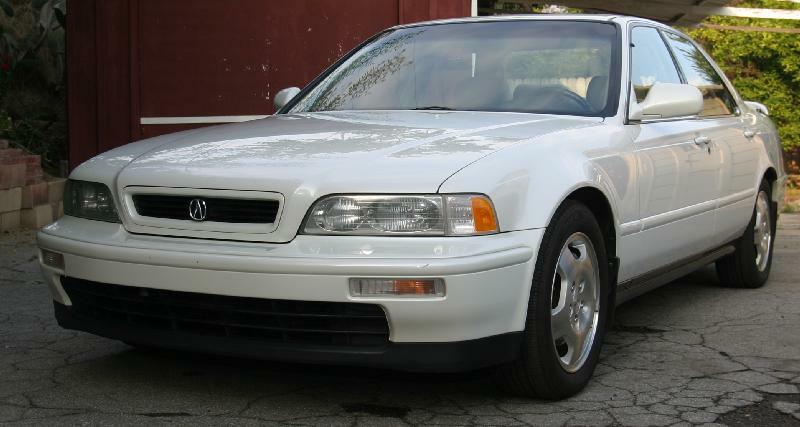 Kind of ironic how 20 years prior when I laid my eyes on that Sherwood Green Legend coupe and knew I had to have one, I was now traveling to Florida to buy a different Acura that I had been lusting over. Dreams do come true for Acura fanatics! 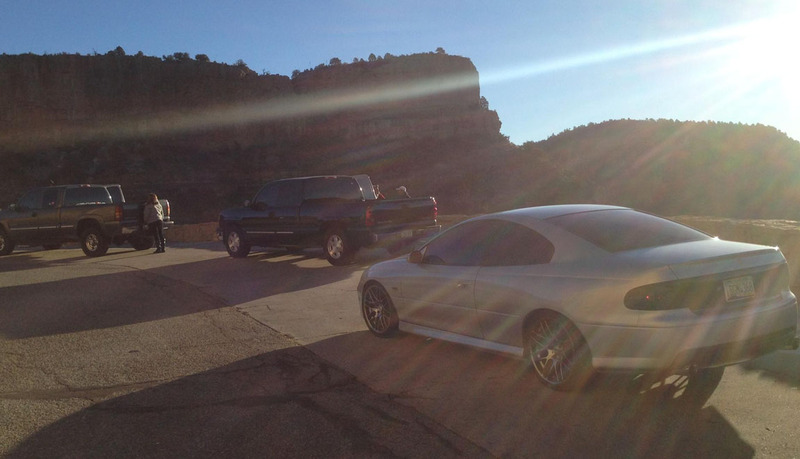 Thanks, guys, for sharing these pics – as well as your great enthusiasm for these amazing cars. Hey, before you all click away, check out this sweet video. My brother Bentley has put a lot of time & effort into building a custom 1968 Chevy Nova SS. Now, it’s the subject of an online contest by H&S Motorsports called “Guess the Power.” If you watch this video, “like” the H&S Motorsports Facebook page, and comment your HP guess, you have a chance of winning a hat. Go for it. I was fixing a salad in the cafeteria at work a few days ago and ran into my coworker Todd who’s been a long-time reader of the blog. 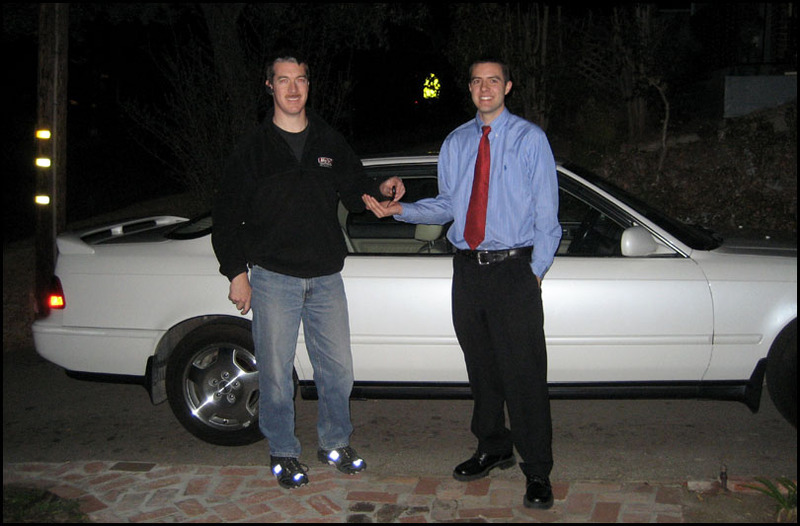 He was excited to tell me about his high-mile acquisition: a 2003 Volkswagen Passat with 304,879 miles on it. The car has clearly been well-maintained to make it this far on its original 1.8 motor, manual transmission, and even clutch. Todd has only had to do a few small cosmetic repairs since taking delivery of the car. I will be staying in touch with him as he presses onward toward the 350,000 mile mark. Shifting sights to the domestic car world, my friend Kyle (and later, my buddy Joe) recently clued me in on this awesome YouTube feature. 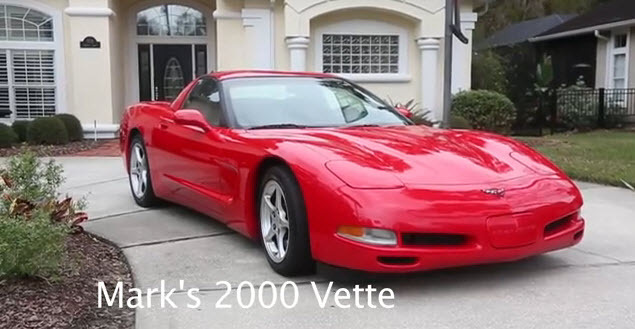 Mark, the original owner of a red 2000 Chevy Corvette, has shared it with the world in a short 2-minute video. The special feature of this Corvette is its odometer which reads over 648,000 miles. Mark’s work commute has caused him to pack on the miles. This particular Corvette is his 5th – and each of his previous cars have also had high miles on them. I congratulate him on his achievement! My own crusade on the mileage front continues. 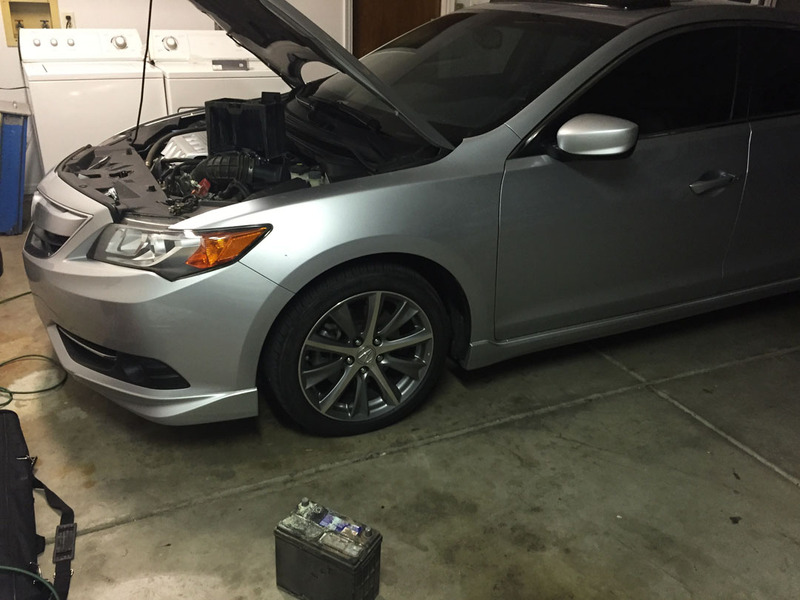 I recently had to replace the battery in my 2013 ILX for the first time. The original unit lasted me about 2.5 years and 109,499 miles. I ended up going with a $135 Duralast unit from Autozone with a 3-year warranty. Out with the old, and in with the new! A few more pics for entertainment before closing. 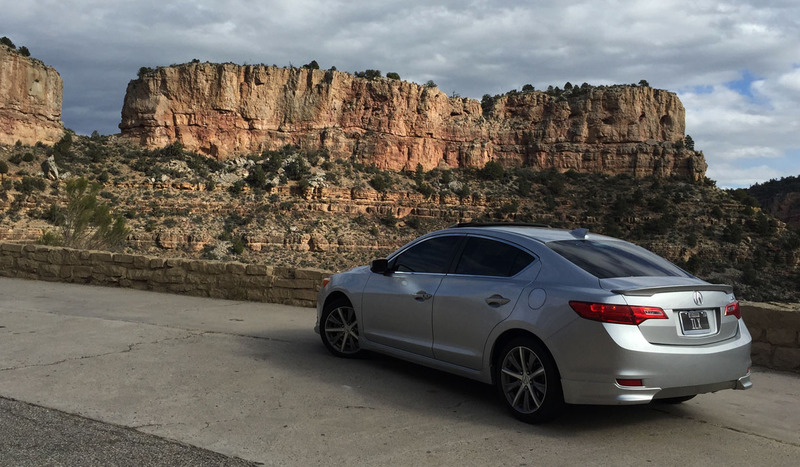 Back on Christmas Day, I took a drive through the Salt River Canyon in the ILX. I took this picture. I sent it to my friend Kyle that day because I knew he’d be driving through the same area. 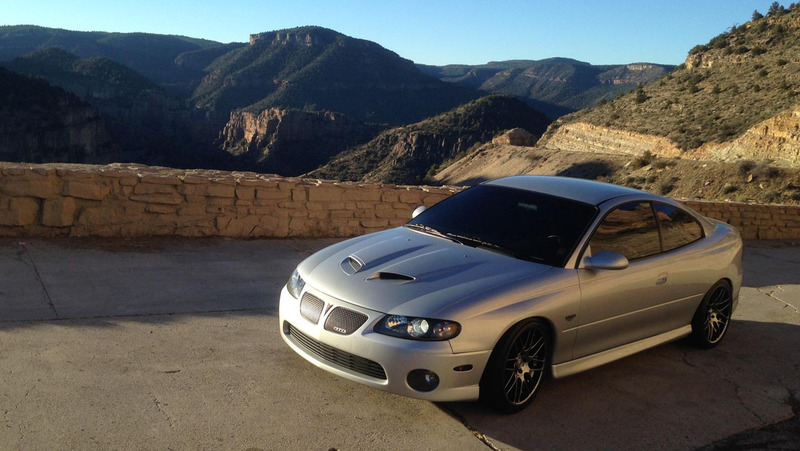 Today, he surprised me by taking a photo in the same location, with his 2005 Pontiac GTO. Nicely done, Kyle! And a very sweet Pontiac, I might add. Today, the Legend came out to enjoy perfect temps. 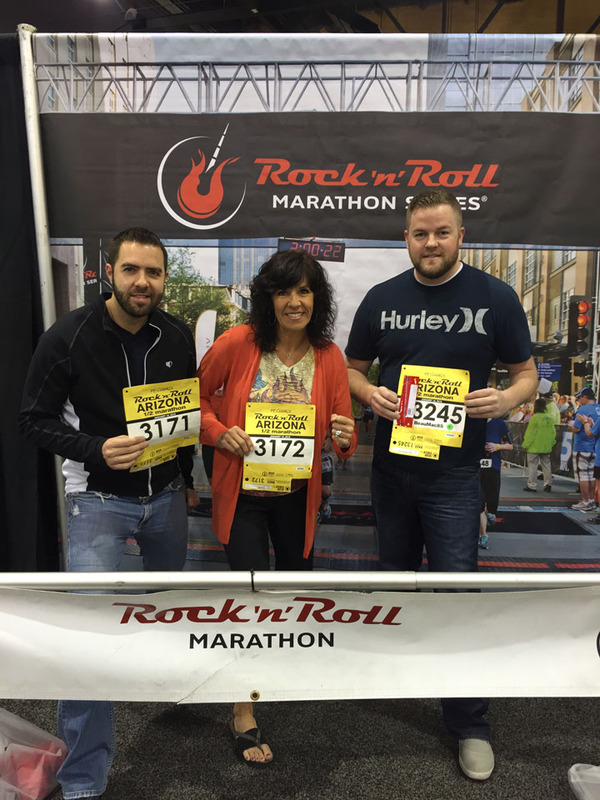 My mom and I are running the Rock & Roll Arizona Half-Marathon tomorrow morning, so we had to go to an exposition at the convention center downtown. 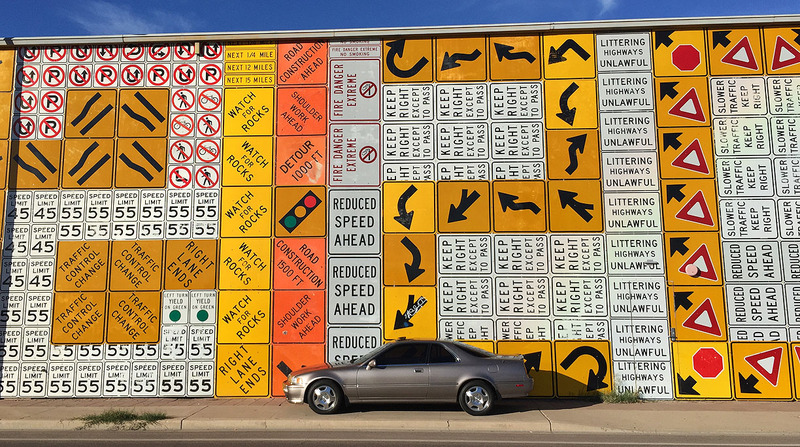 There’s a building on 7th Street & south of Jefferson that is absolutely covered in retired street signs. We got our runner numbers & gear. Then met another friend for brunch. You are currently browsing the archives for the Reader’s Ride category.